What's New for the Smiths? Destinations: Morondava, Kirindy National Park, Berenty Private Reserve, Andohahela National Park, Ankarana National Park, Montagne d’Ambre National Park, Diego Suarez, Ranomafana National Park, Antsirabe, Mantadia National Park, Andasibe National Park and Antananarivo. Madagascar has always been somewhat of a pipedream for me over the years. My decades of nature travel always seemed to incorporate the more conventional destinations like Africa, South America and a few esoteric destinations here or there, but Madagascar, albeit always pretty high on my “gotta-get-to” list, always seemed to be put off for a future trip. As time progressed, the mere mention of the name “Madagascar”, a deep shooting pain in my heart occurred and I knew that it was time to start getting serious about a trip to the island. Although I did have a business stop in ’97 to Antananarivo during the La Selva years, I was not privileged enough to see any wildlife whatsoever at that time. I became familiar on paper with the various national parks and wildlife destinations as I was visiting the in-country offices of Cortez Travel to plan eco-tours to the island. We put together a great 18+ day package that included several destinations that I was partially successful in marketing before La Selva went the way of the dodo in the early 2000’s. All the time I was marketing Madagascar, I just assumed that I would get there myself to experience the wildlife wonders, but that was not to be. 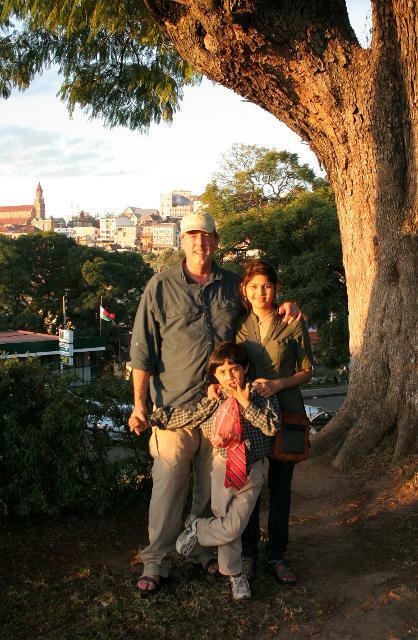 In the fall of 2008, my wife Som and I began thinking about the coming year’s summer trip, and I became addicted to the notion of going to Madagascar - for real this time. But at about this exact time, elements in the country decided to initiate the nation’s most recent coup d’etat. As we were reading about the literally hundreds of people being slaughtered in the streets and markets of Antananarivo, we continued planning the trip as if all would be fine by destination day the following June. Although all was in fact fine during the entirety of our expedition in Madagascar, there were several times prior to departure when we contemplated canceling the expedition. Thankfully we did no such thing, yet we were following up-to-date news reports all the way to the Jo’burg airport on June 17 to see if all was sill OK for our visit. So we entered Antananarivo (Tana) during a quiescent period in mid June of 2009. To boost tourism, the illegitimate government made the $100 visas completely free. That helped save a few hundred bucks right off the top. Although Madagascar is a relatively inexpensive destination, making it a “cheap” trip is not a real possibility. Madagascar is the world’s fourth largest island after Greenland, Papua New Guinea and Borneo. The infrastructure for cross-country travel is very rough and the wildlife destinations usually very far from each other and getting from point A to point B can be challenging. The road network leaves a lot to be desired. While travel over the main spine of the central plateau is doable by car, many of the other roads in other parts of Madagascar are very difficult due to very poorly maintained roads. For example the 80 km trip from Fort Dauphin to Berenty Reserve can take up to six hours as the road is riddled with vast potholes and the entire trip can be described as hellish. So when planning a viable wildlife trip to the country, one needs to use the surprisingly very reliable Air Madagascar. But this does not come cheap – especially when paying for a small family. 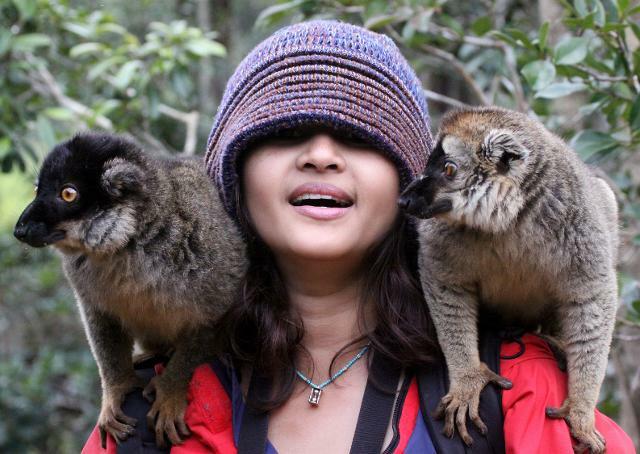 When planning for this expedition, my main emphasis was to include destinations that ensured the possibilities of seeing the maximum numbers of lemur species. Using the resource, Mammal’s of Madagascar by Nick Garbutt, was invaluable – especially the section near the back of the book entitled, “Top Mammal Watching Sites”. This is a must have resource for anyone planning on visiting Madagascar. I designed our expedition to visit as many of the intact habitats of the island as possible during our short 28-day stay there. Visiting the dry forests of Kirindy, the spiny forests of Berenty and Andohahela, the tsingy and temperate forests of Ankarana, the cloud wet rainforests of Mountain Amber and the wet tropical rainforests of Ranomafana, Mantadia, and Andasibe National Parks basically set the stage for seeing approximately 30 species of lemurs and many other species of mammals, birds and reptiles. The one complicating factor that I knew might limit the numbers of species we could see was the season. The austral winter is not the best time to visit Madagascar as many of the species are aestivating and are not observable. I wasn’t sure how many species this would preclude us from seeing but, hey, this was when I had the time off and there really was no choice! Best of luck to us! And when one peruses the species list, luck was definitely on our side. The descent in to Antananarivo (Tana) was surreal. Leaving the hustle and bustle of the very modern Jo-berg international airport in South Africa did not prepare us for the trip back in time to Madagascar. After all of the reading about the ecologically devastated central plateau of Madagascar, I found it surprisingly beautiful. The endless grasslands punctuated by small villages composed of Frenchesque mud houses all connected by deeply rutted dirt or mud roads were striking. Although the red-Madagascar earth was opened from erosion everywhere we looked, some of the gentle rolling grass-covered hills were divided by ravines with intact native forests. I couldn’t help but wonder if these microhabitats still housed some of the world’s most unique and endangered species. Tana is a world away. I have traveled to many of Africa’s mega-cities, but Tana was different in many ways. The French feel to the city was blatant, but the chaotic frenzy of the city had a uniquely African flare to it. The streets are without scheme and jam-packed with diesel bellowing trucks and Peugeot cars. Pedestrians clogged every street and alleyway for miles. I asked our driveway if this was rush hour or a special event day, but he replied that this was normal and in fact this was light traffic compared to “market day” or the actual rush hour later in the day. Our slow, traffic-induced progression allowed us a two hour drive through Tana to the Sakamanga Hotel (http://www.sakamanga.com/), during which we were introduced to the sights, people, smells and noises of Tana. It was frightening while at the same time spectacular. 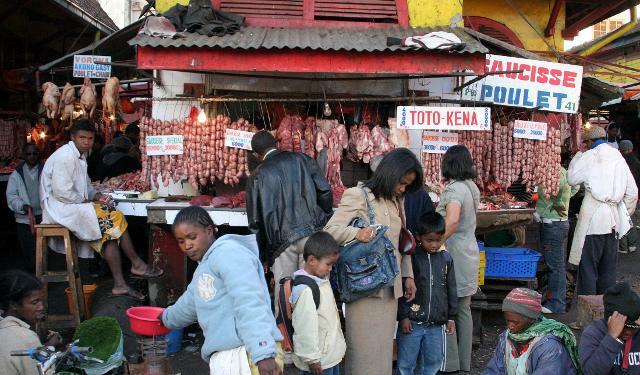 Our first afternoon was spent strolling the streets of Tana, visiting the main market. 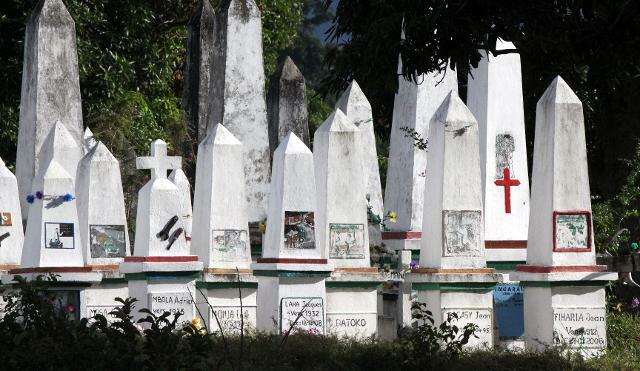 The people were splendid mix of Malayo-Indonesia features (from the first explorers who arrived on the island almost two millennia prior) and the Indian and African immigrants who came much more recently. 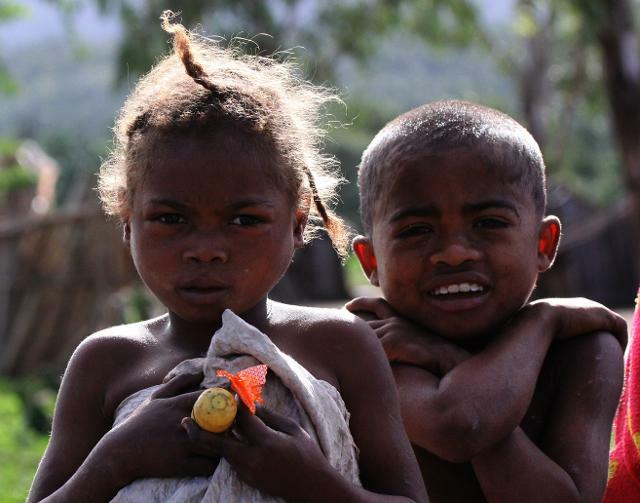 The Malagasy are strikingly beautiful people. 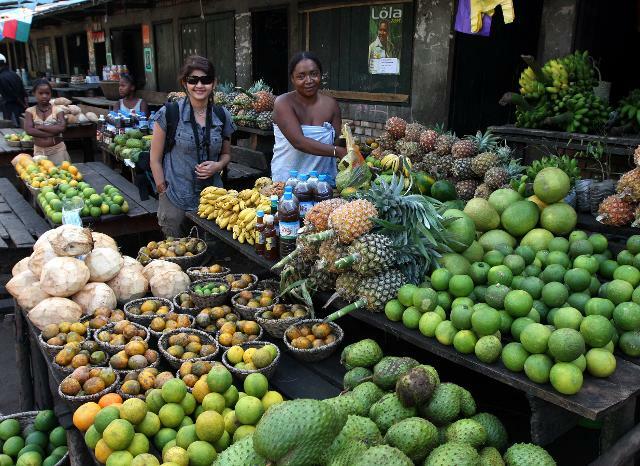 While strolling the open-air market, we took in the sights and smells of Tana. I was also lucky in avoiding a near pick-pocketing by a young buck eyeing my Quan Nin necklace. Luckily my American street sense allowed me to see him casing us. After a quick, gentle, albeit not-so-subtle, confrontation let him know that I was on to his plan, and he backed off without incident. We enjoyed the chaotic market until late afternoon and eventually worked our way through the hilly side-roads of the capital city. We were reminded we were in a nation that was in the midst of a violent coup d’etat. While taking some sunset images of the city, a man in a uniform came screaming after us demanding me to hand over my camera. Not speaking a word of Malagasy, I was very confused as to what he wanted yet was not about to hand over my brand new camera. He kept trying to take it from me, but after I played back the last ten or so shots showing him that I had only taken innocent sunset people pictures, he eventually quieted down and let us go on our way. I still have no idea what he thought we were taking pictures of, but I was much more careful from that point forward of what I photographed. The Sakamanga Hotel, the best in Tana! Fresh veges at the Tana market. Our time in Tana was short but interesting. 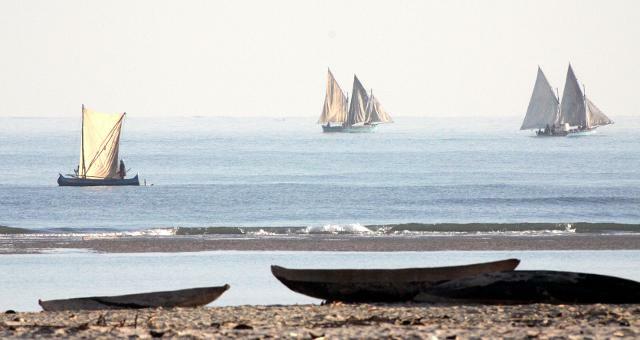 We had to continue on our three day journey the next morning to Morondava on Madagascar’s west coast. We were met by Gary, our American ex-pat host, and his Malagasy wife at the airport. I had contracted with them for a four day excursion to Kirindy National Park, known to be one of the premier wildlife viewing sites in Madagascar. After a short chat with Gary, we headed down what at first seemed like a good road out of the Morondava. Well that lasted for about 6 kilometers, and then we had our first introduction to Madagascar roads. Having traveled extensively in other parts of Africa, this was not at all unusual for me, but Som was a bit taken by surprise. But she reminded me that this road was nothing compared the road from Lake Baikal to Ulan Ude in Buryatia Russia a couple years before which took over eight hours to travel about 40 miles. Our drive through the Morondava countryside was spectacular. Passing village after village with a seemingly never ending parade of pedestrians eventually gave way to a quieter, rural setting punctuated with wetlands and grand baobabs. Our driver, most likely wanting a smoke, found a picturesque spot where he encouraged us to stroll a bit and take some pictures of the magnificent trees. We gladly took him up on his offer and spent the better part of an hour photographing the trees, Madagascar Kestrels, Squacco Herons and Bee-eaters and even a Great White Egret which I later found out was yet another endemic to the island and not the same species of great white egret that I had seen on virtually every continent of the planet. A Madagascar Squacco Heron near Kirindy. Cokie escaping from the local children! Our very first wild Lemur! This Verreaux's Sifaka (Propithecus verreauxi verreauxi) was seen with his troop in the Kirindy dry forest. The dusty road gave way to a very sandy road leading ever deeper in to the dry forest of Kirindy. 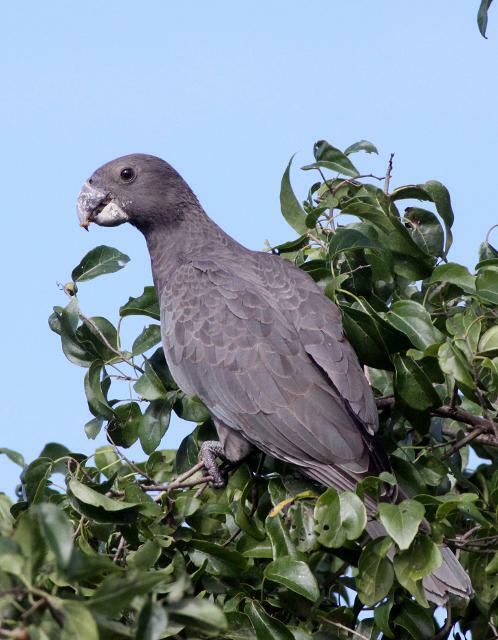 We spied Hook-billed and Chabert’s Vangas as well as Lesser Vasa Parrots along the road. This was a unique experience for me – every species I was to see over the next four weeks would be a lifer for me! 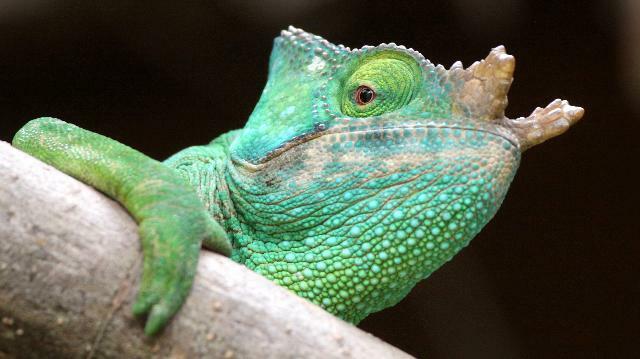 And virtually every species was to be a Madagascar endemic. There are very few places left for me to travel to that would allow for such an experience. The camp at the Kirindy headquarters was basic but immediately friendly. We were welcomed by our guide, Christian, and the lovely cook, whose name we never got. We were treated immediately to an amazing steak lunch that was marinated in a sauce that rivaled anything that Som ever put together. Som immediately wanted the recipe. After we got settled in our flea-infested cabin, and learning about the on-sight thief that we needed to be vary wary of (some German tourists had just been robbed of several hundred euros) we immediately started our wildlife watching. Nick Garbutt writes that Kirindy is one of the wildlife highlights of Madagascar and boasts some of the best nocturnal wildlife watching anywhere. He was dead-on correct! The elusive Narrow Striped Mongoose (Mungotictis decemlineata) seen on the forest floor of Kirindy. 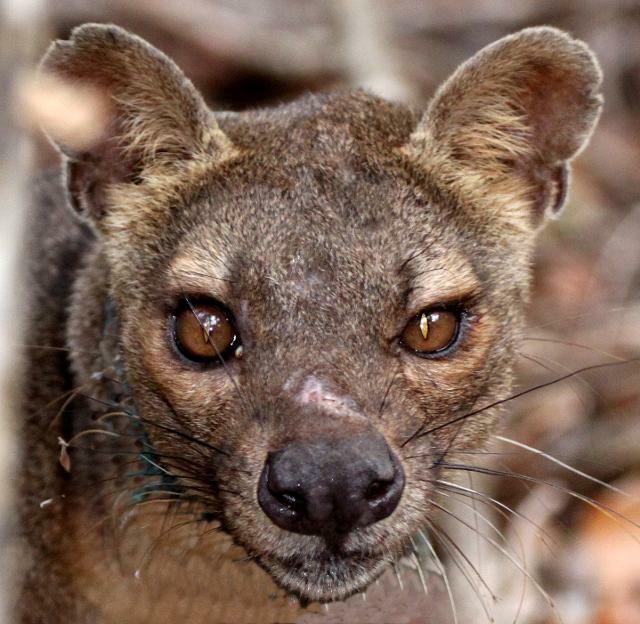 During our first hours at Kirindy we were treated to sightings of Red-fronted Brown Lemur, Verreaux’s Sifaka, Narrow-striped Mongooses and even two surreal Fosa, Madagascar’s top carnivore. Our first night walk brought easy and quality sightings of many of the remaining species Kirindy is known for. 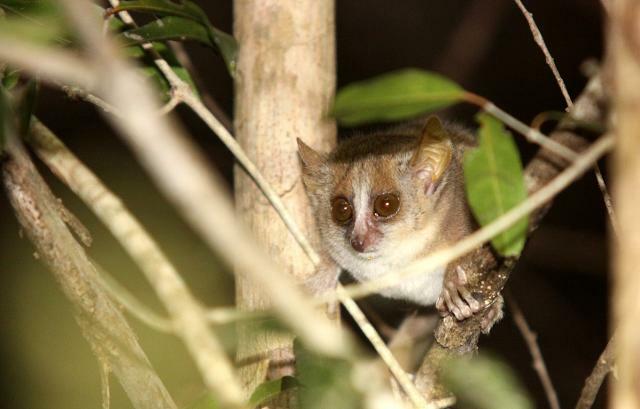 During our first three hour night hike, we spotted Grey Mouse Lemurs, Red-tailed Sportive Lemurs (whose calls echoed throughout the nighttime forest), Pale Fork-marked Lemurs, Coquerel’s Giant Dwarf Lemurs as well as the world’s smallest primate, Madame Berthe’s Mouse Lemur. We were granted permission to place a few traps about our cabins which would potentially allow us sightings of some of the harder-to-see rodent species. One night of failing to catch anything in our traps, I relocated them in to the canopy of the surrounding scrub, and nailed many individuals of Western Tuft-tailed Rats. After reading that this species rarely sets foot on the forest floor, I decided to try placing the traps in the trees and the decision paid off. We were fortunate to see 12 species of mammals within our first 48 hours of being in Madagascar. Our expedition was off to an amazing start! After two full days in Kirindy, we basically increased the frequency and quality of our sightings of the various species there. Added about 30 species of birds including Madagascar Cuckoo-shrikes, various sunbird species, Giant and Crested Couas and many more. 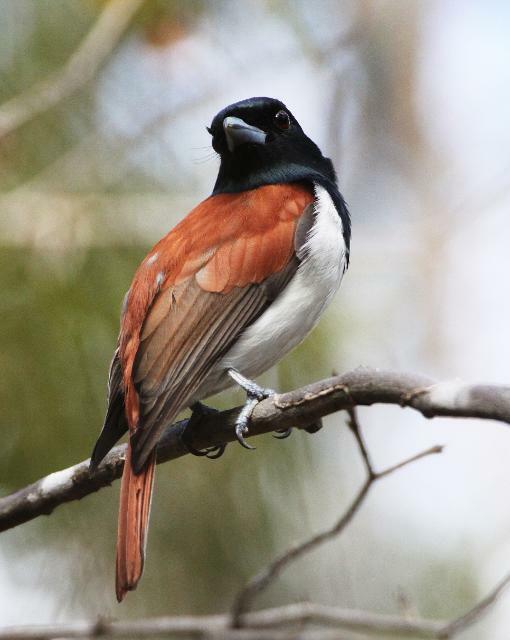 The avian highlights were the Madagascar Blue and Rufous Vangas. Vangas are a group of birds indigenous to Madagascar and the surrounding islands and are easily the region’s most spectacular avifauna. One of my main goals for Kirindy was the Giant Jumping Rat which has eluded us during our first couple days on site. However on our final night walk, we heard what we thought was the rat in the forest gallery directly next to the road. Unfortunately we did not have any luck finding the critter. After returning to base camp and imbibing a bit more Petron tequila (that we picked up in Atlanta at the duty free shop…), I had the urge to head back in to the forest and find those damn rats. So I did just that. After about a kilometer or two in the dry deciduous forest, I caught a glimpse of what looked like a giant rat foraging in the trail. It allowed me to approach a bit closer and I was somehow able to balance the heavy camera and my spot light in order to snap a few images of one of the most amazing animals I had ever seen – the Madagascar Giant Jumping Rat. While returning, I heard the calls of at least two dozen additional rats. It was a veritable Giant Jumping Rat rage in the forest that night! The best mammal of the Kirindy for me! 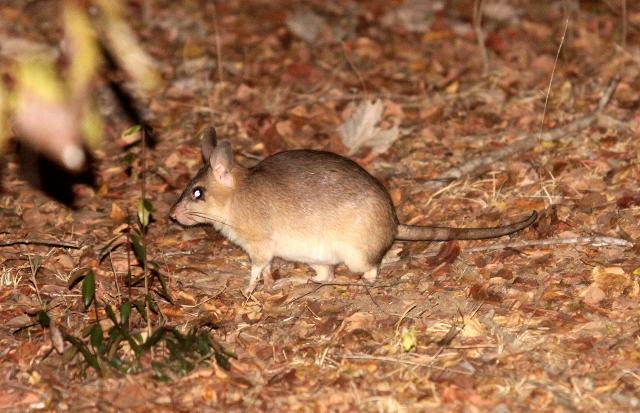 I was pleased to finally see a Giant Jumping Rat (Hypogeomys antimena) at Kirindy! 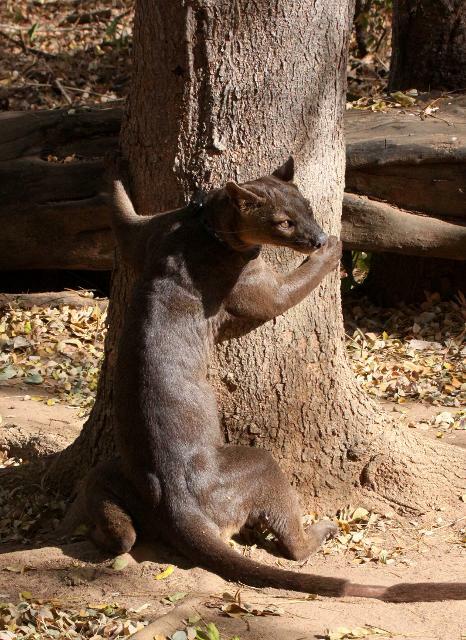 Perhaps the most impressive animal of Kirindy was the Fosa (pronounced locally, ‘foosa’). 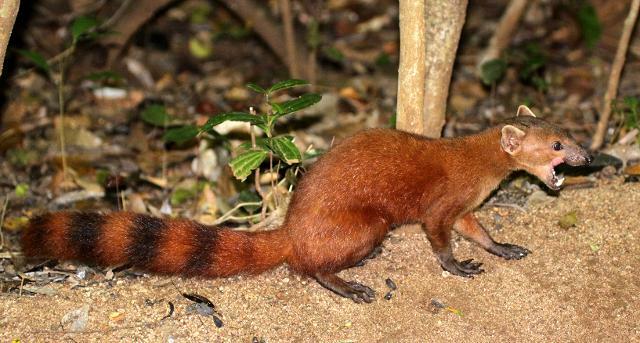 Being part of Madagascar’s unique and enigmatic mongoose family (family Eupleridae), Fosa have a somewhat mustelid look but one could also claim to see feline and even canid characteristics. Fosa are very effective hunters, with arboreal lemurs as the main part of their diet. They are famous for being able to jump through the forest canopy so effectively that catching lemurs in mid-canopy is commonplace! Most of the behavior we witnessed was limited to scavenging around the base camp and stalking on the forest floor. But we did have the pleasure of watching about $200 of my REI wardrobe being devoured by a male Fosa who evidently found my body odor irresistible! Later that morning we were reminded just how unpredictable and ferocious Fosa were. Cokie had been warned about the Fosa and was limited to playing on the deck of the cantina or in the dirt directly in front of either Som or myself. This worked well for the three days there but on our final afternoon, I noticed a Fosa enter base camp and take the pouncing hunting posture near the cantina. Cokie was nowhere around so I really thought nothing of it and in fact enjoyed watching this behavior from such an impressive carnivore. Within seconds however, I realized what was causing such behavior when I saw Cokie walking around the corner from the cabin. His approach was out of my sight line and all I could see was the Fosa getting ready to pounce! I immediately jumped up screamed at Cokie in the direction of the Fosa. Cokie saw what was going on immediately and dove toward the deck of the cantina and the Fosa leapt in the opposite direction thankfully! Too close for comfort for sure. Our resident Fosa (Cryptoprocta ferox) who nearly had Cokie for lunch! 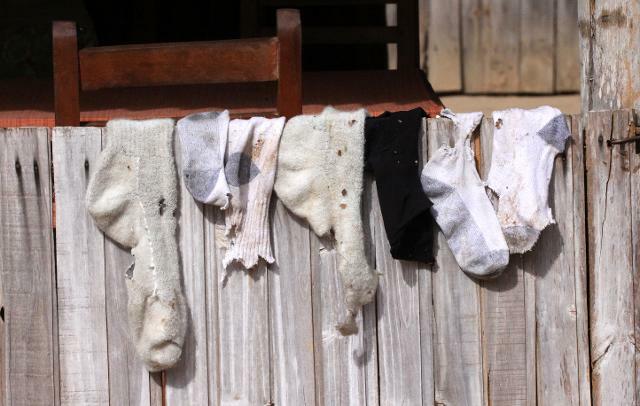 Just a small sample of the damage one Fosa can do to drying clothes! Our time at Kirindy was definitely too short but we had many more potentially amazing destinations yet to visit. We killed the morning and early afternoon with some forest strolls spotting more Sifakas and Brown Lemurs, ever-searching for better images. We headed out in time to attempt a sunset stop back at the Avenue du Baobabs. Our plan was flawless as we arrived just in time for one of the most spectacular sunset sights I have even seen. The warm, late afternoon glow on those ancient trees was a sight of a lifetime. After watching the hot Madagascar day turn in to a crisp, cool austral winter evening we eventually left the Avenue and arrived at Chez Maggie on the coast of Morondava for our last night in this part of Madagascar. The food and atmosphere of Chez Maggie could not be beat. The prawn curry was every bit as delicious as anything I have ever sampled in Som’s native Thailand! 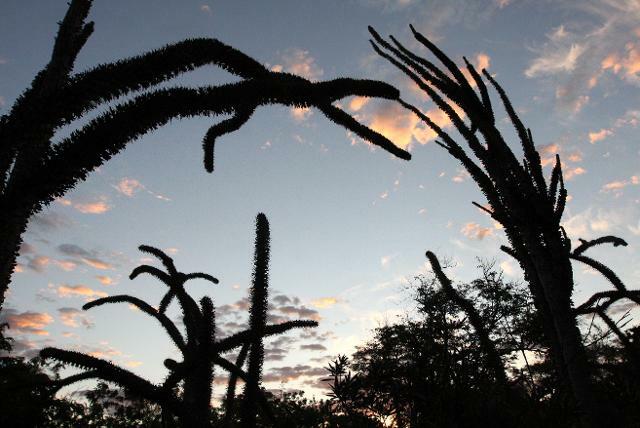 Our spectacular sunset at the Avenue du Baobabs. Our next day was one of the great unknowns on our expedition. 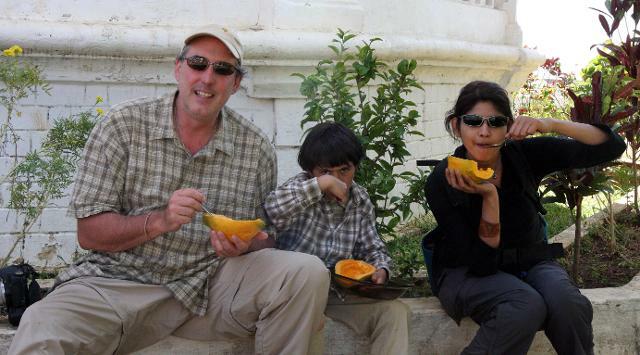 Being the experienced tour designer for many years, I always prided myself in my ability to put together itineraries that maximized the numbers and variety of habitats and species to be seen, while at the same time offering great cultural exposures and travel comfort and ease. But every once in awhile, a tough travel day was necessary. And this was just that – a multi-legged air journey in a very third-world country. Generally this is a tour industry no-no as you never really know how reliable domestic airlines can be and this day had connections with as little as 45 minutes between flights! But Air Madagascar shined as an Airline that was both professional and punctual. At no point on our entire trip did this airline fail us in any manner. Hats off to Air Madagascar! 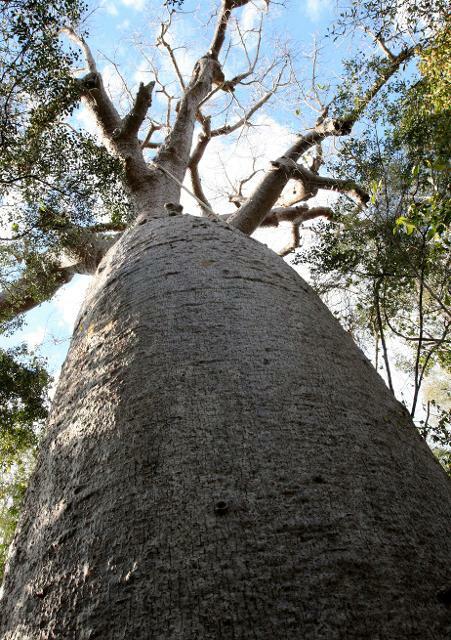 Adamsonia za, the largest Baobab tree in Kirindy! Christian was our great guide in Kirindy! We spent hours trekking for miles in the dry forest of Kirindy. 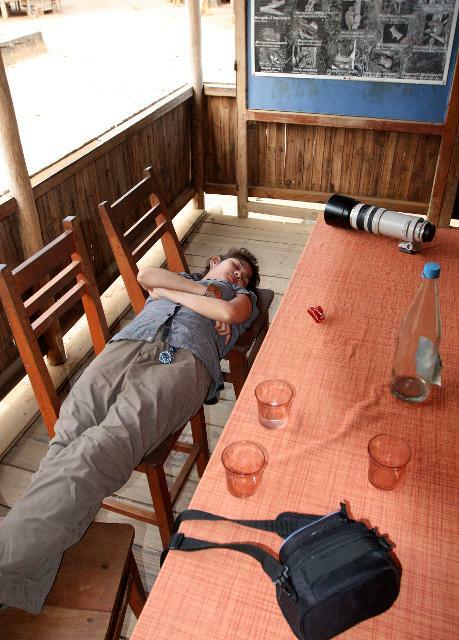 Som totally crashed after a full day trekking for miles! 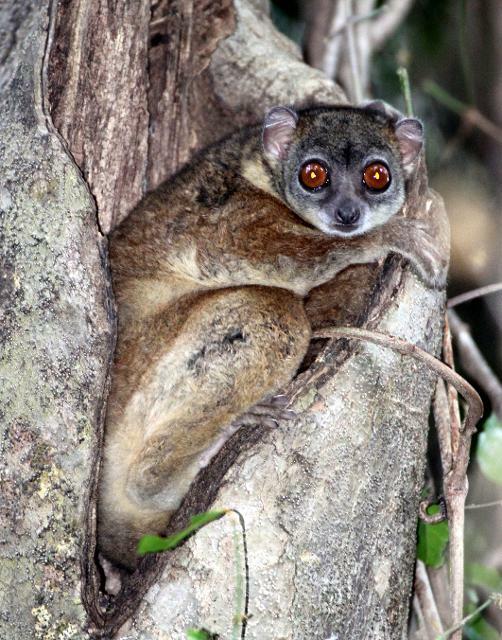 The Red-fronted Brown Lemur (Eulemur rufus rufus) was common in the forests of Kirindy. 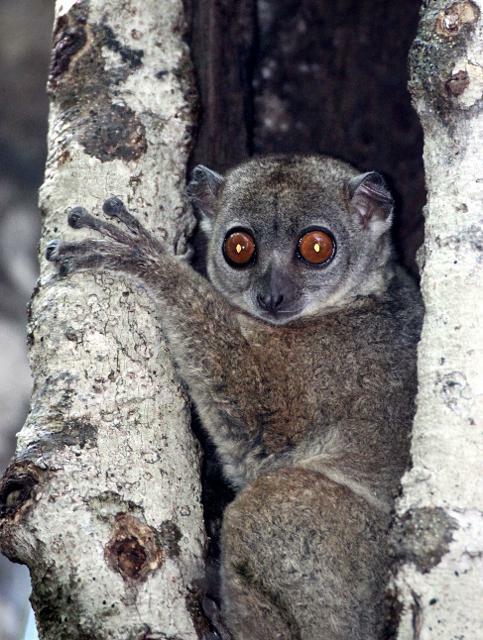 The Red-tailed Sportive Lemur (Lepilemur ruficaudatus) was the most common Lepilemur species. 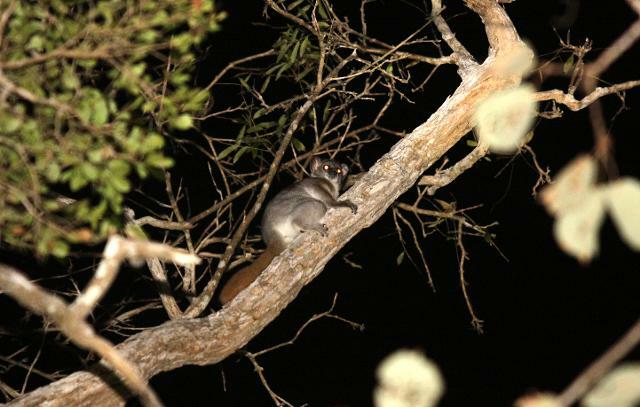 We were very fortunate to see the very rare Pale Fork-marked Lemur (Phaner furcifer pallescens) during one of our night walks in Kirindy. Another rarity, Coquerel's Dwarf Lemur (Mirza coquereli). 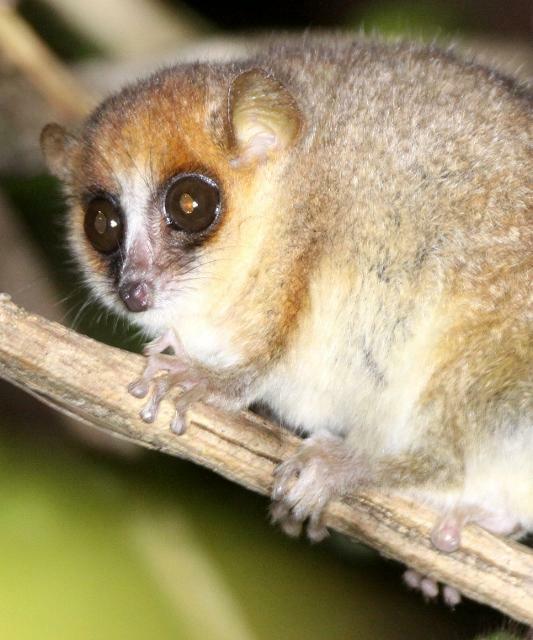 Madame Berthe's Mouse Lemur (Microcebus berthae) is the smallest primate on the planet, and we saw many in Kirindy! 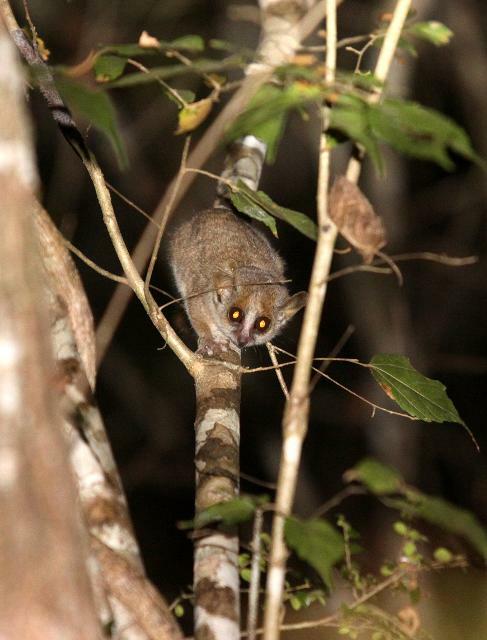 The Grey Mouse Lemur (Microcebus murinus) was the most common lemur seen during our night walks in Kirindy. 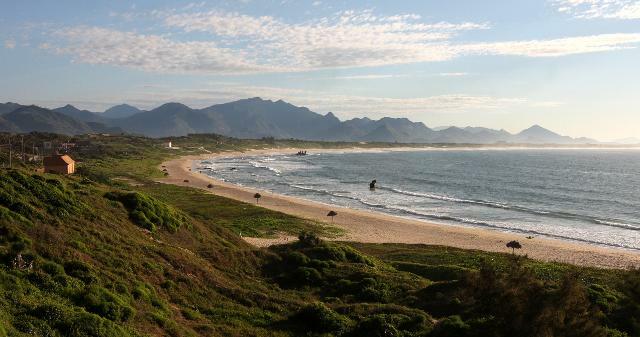 Fort Dauphin Beach, north of town. Our next destination was the old mining town of Fort Dauphin located near the southern-most tip of Madagascar. 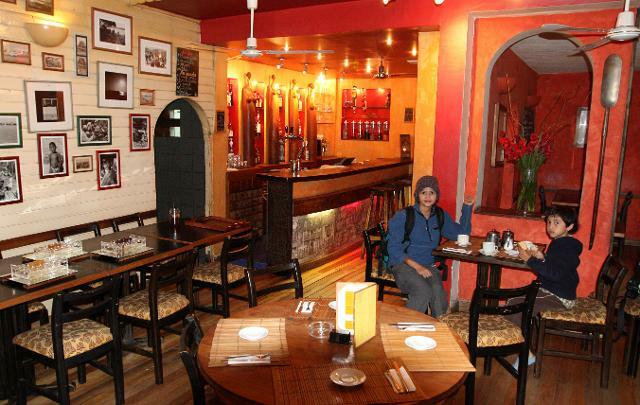 Although we arrived at night, we had a chance to drive through the hustle and bustle of the city’s night market and settle in for a very nice meal at Le Dauphin, our upscale lodge, for the evening. Le Dauphin is the main headquarters for making arrangements for the famous Berenty Nature Reserve, which was our primary destination. While our overall four-night, five-day stay in the region was highly productive, comfortable and successful, I cannot recommend the tour arranging capabilities of Le Dauphin. Their communication is awful, and I have never seen a more poorly organized travel outfit in my entire career. They were debating with me whether or not I had actually paid for the trip for many weeks after the trip was already finished! At least they were professional enough not to create any embarrassing or itinerary-altering scenes while were in the middle of our program, but I had a hell of a time convincing that that I had actually paid for the trip. With all this being said, the guides and drivers we had during the Berenty-Andohahala portion of our Madagascar stay were all fantastic and extremely knowledgeable and professional. The drive from Fort Dauphin to Berenty was extremely scenic albeit on one of the worst roads in the country. But the slow pace of the drive made viewing the villages and countryside all that much easier and enjoyable. A last minute fruit stop before heading out in to the spiny forest. The Mahafaly tombs found commonly on the road to Berenty. A spectacular spiny forest sunset in Berenty. 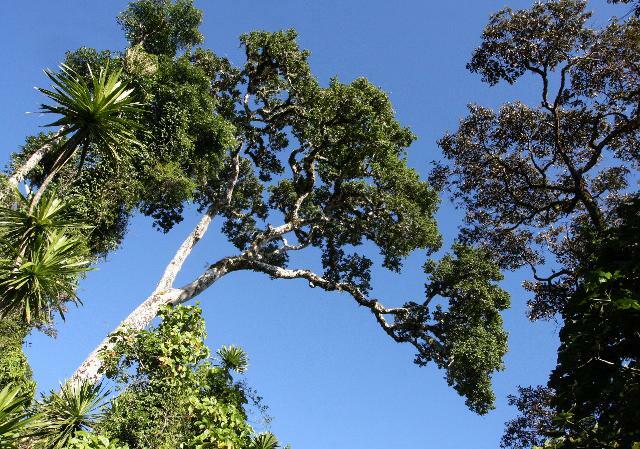 Berenty itself is a small private reserve that occupies a gallery of remnant tamarind forest and spiny forest that somehow survived the massive and nearly complete deforestation of this region of Madagascar. Sisal plantations occupy thousands of hectares currently in this part of Madagascar. Although these plantations do employ scores of grossly underpaid indentured laborers, the plants they farm are a seriously invasive species that have long since escaped from the plantations and are now widely intertwined in the native habitats throughout Madagascar creating impenetrable thickets of Agave wherever they become established. Our accommodations at Berenty were more than we expected as were the dinners and service. Berenty is thought of as being generally over-priced, yet, while that may in fact be true, I felt we got our money’s worth from our stay there. And let’s be honest, there are no other real options for seeing the amazing spiny forest community anywhere else in southern Madagascar. So if one wishes to see this area, Berenty is a necessity. As with most of our destinations in Madagascar, we spent our days trekking the forests and our evenings on night walks with spotlights. In Berenty, we were treated to spectacular views of such wonderful species as, Ring-tailed Lemurs, some more Red-fronted Brown Lemurs (although they certainly looked very different than those we saw in Kirindy), Grey-brown Mouse Lemurs and dozens of White-footed Sportive Lemurs, a nocturnal species we also saw often in the daytime. Without a doubt, though, the visual highlight of Berenty was the dancing Verreaux’s Sifakas which we often saw prancing their way through the open-floored spiny-forest galleries. They were both graceful and goofy! 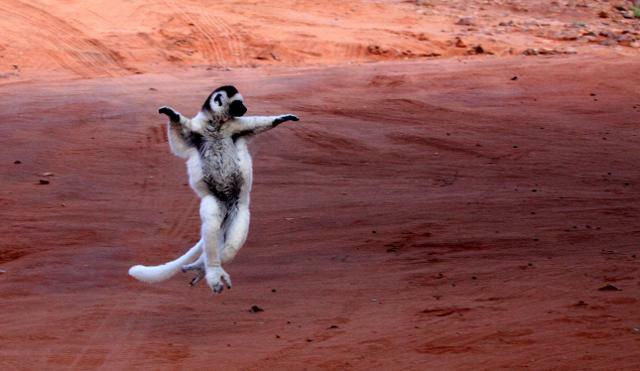 Verreaux's Sifaka were often seen prancing across the open areas of Berenty! 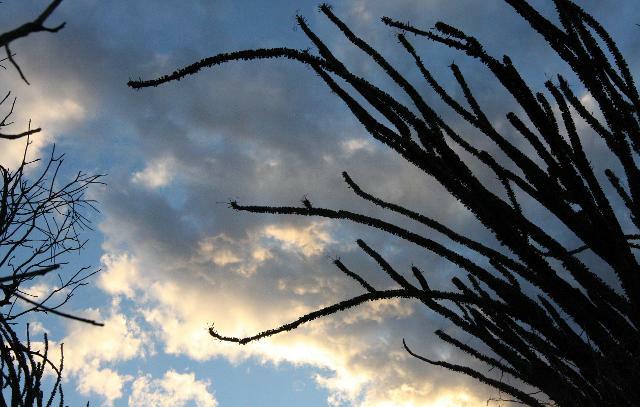 The spiny forest is an awesome and unexpectedly stunning plant community. Filled with Alulaudia procera and Alluaudia ascendens giants, the forest is filled with plant species that only Dr. Seuss could have dreamt up. The tall and contorted Alluaudia forests were filled with countless other species of xerophytic species that somehow evolved in some of the harshest conditions on the giant island. While this is a very populated area, virgin tracts of this forest type are rare indeed. While Berenty and the nearby section called Anjampolo are home to some truly spectacular parcels of the spiny forest, they are basically forest islands and anything but pristine. Knowing this ahead of time, I requested to be taken up for some time in the larger spiny forest areas of Andohahela National Park located further east of Berenty. Here we spent two days trekking through the much more pristine spiny forest ecosystem and camping in the middle of it all. While seeing the wildlife is much more challenging here due to the vast size of the park, seeing the intact ecosystem lifted my spirits quite a bit considering how devastated the surround areas were. The Alluaudia and Didierea madagascariensis-dominated plant community of Andohahela were a treat for the eyes and absolutely a botanist’s wet-dream! There were tons of reptiles viewed during the trek including such species Chlaradon rock iguanids and Mimophis mahafalensis which had just pigged out on some unsuspecting rodent that remains unidentified. The mammal watching really picked up in the evening when we spotted many more Verreaux’s Sifakas brachiating through the spiny forest canopy. We also spotted many more White-fronted Sportive Lemurs, Ring-tailed Lemurs and Grey-brown Mouse Lemurs in great forest conditions. A White-footed Sportive Lemur (Lepilemur leucopus) seen glancing at us from the canopy of the Alluaudia forest. This Grey-brown Mouse Lemur (Microcebus griseorufus) was so damn cute! A group of mammals that we were really hoping to see but not expecting to, due to the austral winter, were the tenrecs. Most of these species were purported to be aestivating for the winter and would not be viewable. But I knew our best chance was to be in Berenty as it generally has a fairly mild winter. 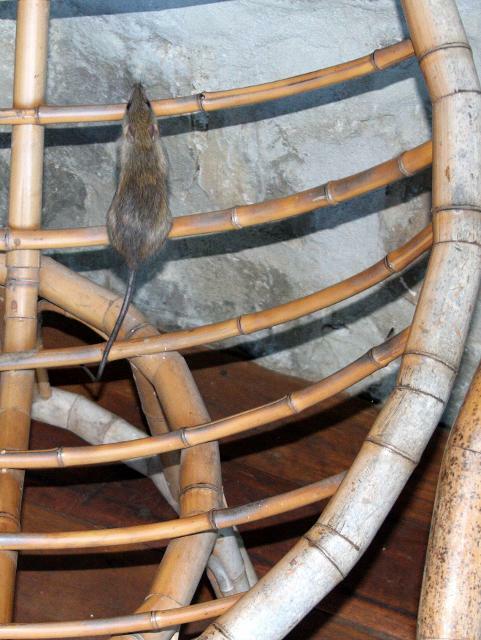 I asked our guide to keep an eye out and spread the word that we would like to see a tenrec. I felt we had a good chance. 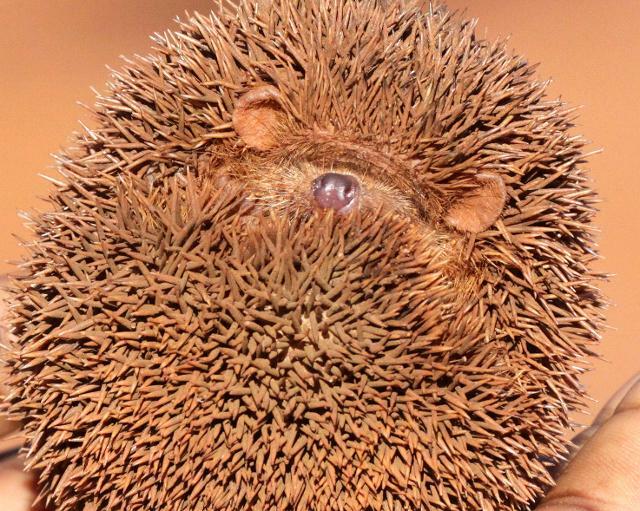 During our on last day, our guide came running to our chalet to tell us that someone on the compound had in fact found a Lesser Hedgehog Tenrec. I had a feeling that once news was out that the tourists wanted to see a tenrec, workers began digging to get one in order to garner a tip. Seeing what was to be our only tenrec was a mammalian highpoint for us on the expedition. 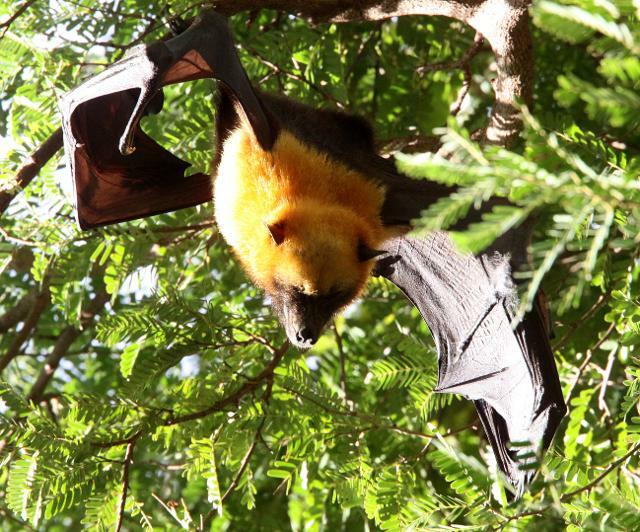 The Madagascar Flying Fox colony present on the grounds was another highlight of Berenty. 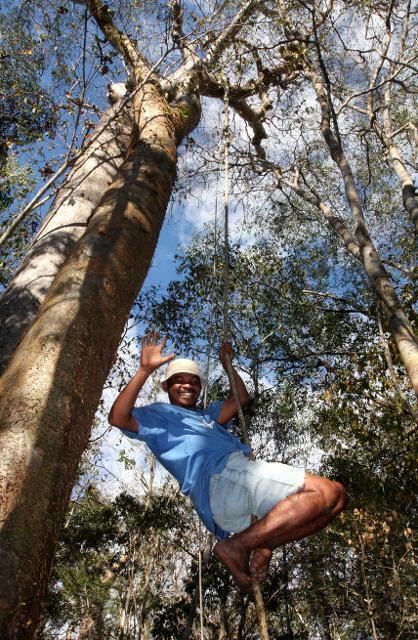 We came across a very large Madagascar Flying Fox colony while in Berenty. 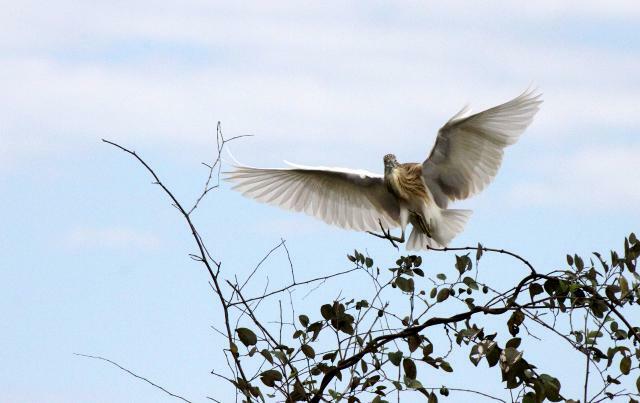 There were many more bird species added to our list while in the Berenty-Andohahela ecoregion. Hook-billed and Chabert’s Vangas were seen regularly as were large flocks of the spectacular Sickle-billed Vangas. 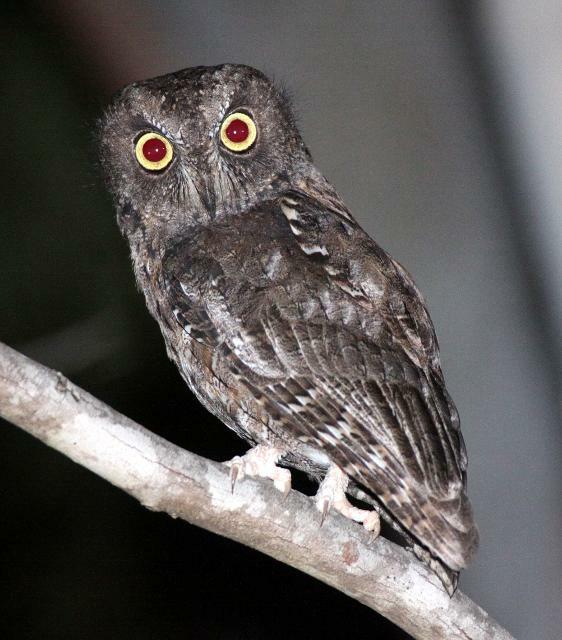 Madagascar Scops Owls and White-browed Owls were regularly seen in both the spiny forests and the tamarind forest gallery. More Couas were spotted as were at least two species of Jery. Our time in Berenty was rife with wildlife sightings that were both numerous and of high quality. But we were also treated to many encounters with the local population of the Antandroy tribe. While we had the pleasure of viewing and experiencing many tribal groups in Madagascar, our time with the Antandroy was be far the most interesting and in-depth. We visited their villages and spent time talking with them (with translation of course) and sampling their foods and spirits. We purchased their basketry and handicrafts. We were privileged to see their Independence Day celebrations and their Zebu markets during our short yet rewarding stay in their homeland. Well, I knew it had to happen sometime, but thankfully during our entire stay in Madagascar, I was the only one to get sick to any degree – both Cokie and Som were untouched and completely healthy throughout the entire expedition. We are pretty sure that the night of camping in Andohahela was the point in which our cook failed to wash the knife completely between slaughtering our fresh chicken and cutting up our papaya dessert. Some micro-critter found its way in to my belly and caused a couple days of crud. But all in all this was not a major problem and I quickly recovered after a solid night’s sleep in our next destination, Ankarana National Park. 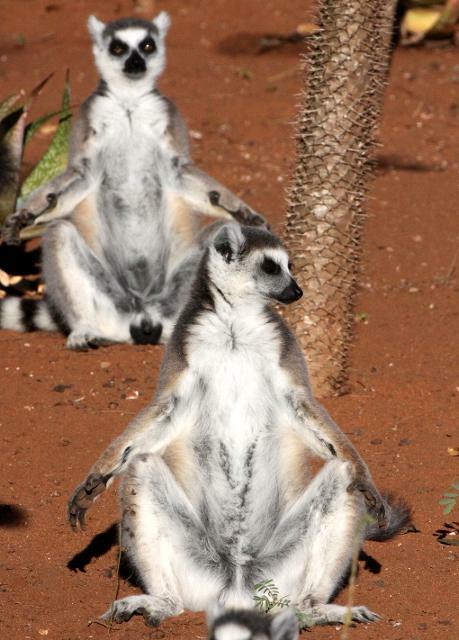 We came across hundreds of Ring-tailed Lemurs (Lemur catta) while in Berenty and Andohahela. Cokie "meditating" with some new friends. The spectacular Alluaudia forest of Berenty. Some of the village children in Andohahela village. The Lesser Hedgehog Tenrec (Echinops telfairi) is absolutely one of the cutest critters anywhere! 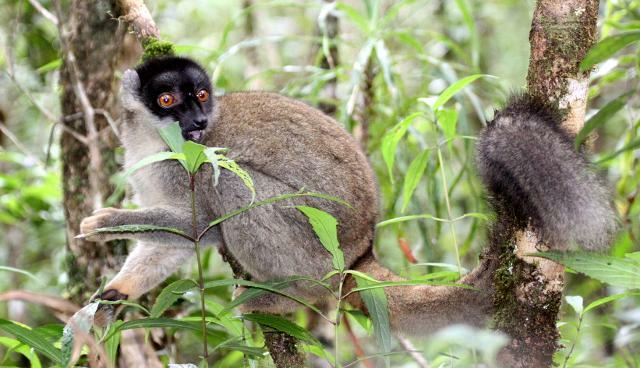 The Eastern Red-fronted Brown Lemur in most likely a different subspecies in this region. The pig on the back of the bike was running around camp just a few minutes earlier! Madagascar Scops Owls were a common sight in the forests virtually everywhere in Madagascar. 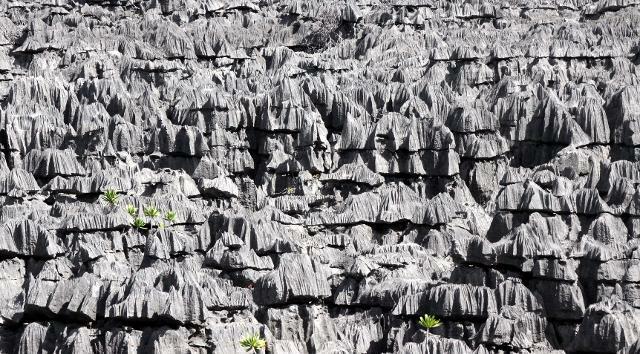 The magican Tsingy formations of Ankarana. After another long travel day, we made it from the deep south of Madagascar to the northern-most tip of the island. Our main destination was Ankarana National Park, just a couple hours south of Diego Suarez. 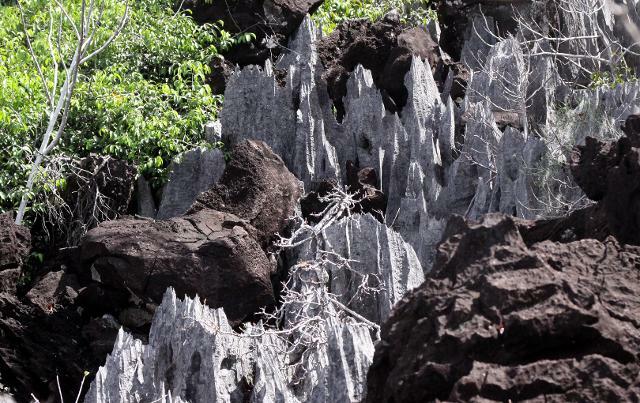 Famous for the spectacular limestone tsingy formations, Ankarana is home to many endemic species and some of the most spectacular scenery anywhere in Madagascar. 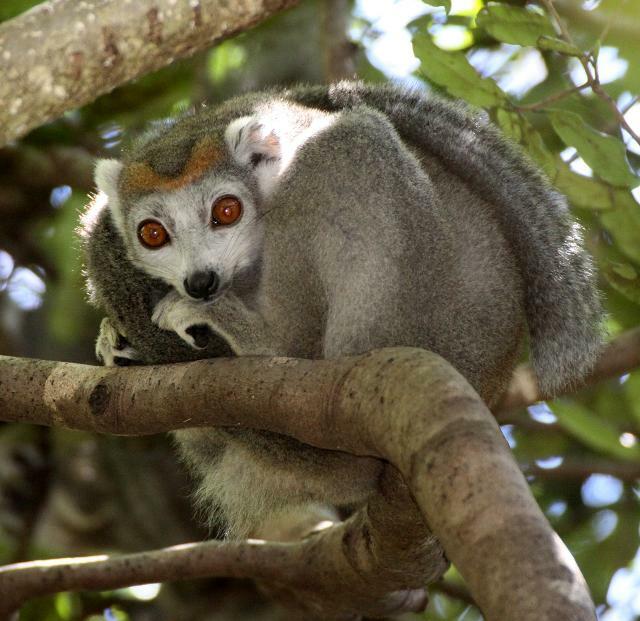 Almost 15 years ago, I saw a nature special on Madagascar where some researchers were exploring the deep forests in and around the spectacular limestone crags of Ankarana, and I knew right then that I had to get there. Well, we finally arrived in Diego Suarez and we made our way to Ankarana in great time. The road was good and we stayed at the rustic but more-than-adequate Tsingy Lodge (not to be confused with the Tsingy Lodge located further south in Madagascar). The entire day was my sickest day in Madagascar and I was feeling particularly awful when we started our trek in to the mixed forest of Ankarana. Luckily today’s was to be a short trek down to some massive caves in the heart of the forest which houses large colonies of Madagascar Rousettes and Madagascar Straw-coloured Bats. 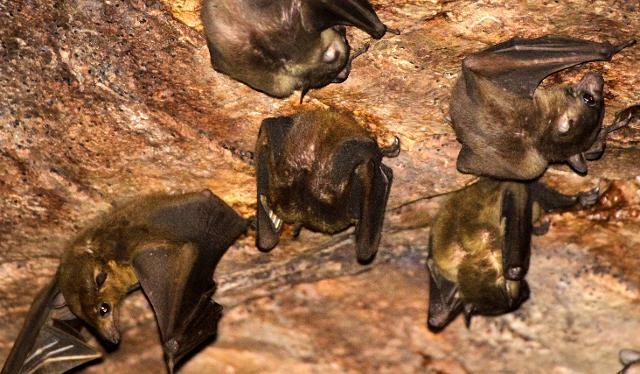 Situated in opposing sections of the massive Bat Cave (Grotte des chauves souris), large assemblages of the magnificent and large chiropterans flew about in response to our annoying spotlights. Madagascar Rousettes (Rousettus madagascariensis) seen in "Bat Cave" in Ankarana. 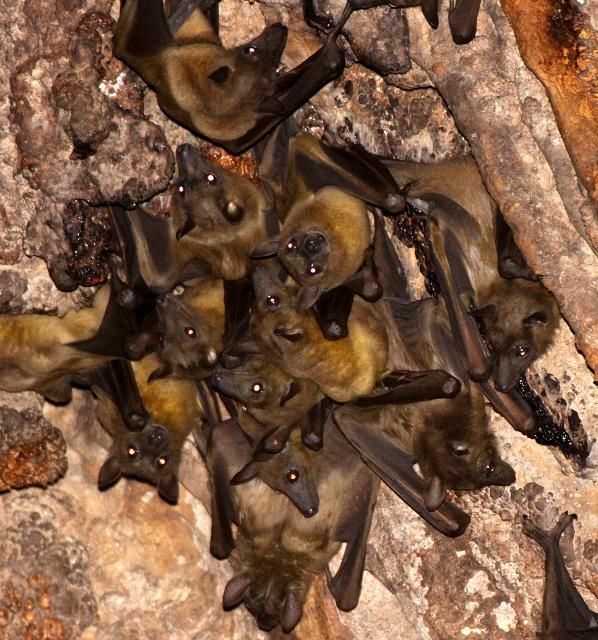 Madagascar Straw-colored Fruit Bats (Eidolon dupreanum) are also found in Ankarana's Bat Cave. Right around this time that I noticed that my illness had not mended 100%. I as barely able to make it up the 100m ascent to the main trail from the bat cave. But once on top of the trail I felt strangely energized when our guided pointed out a pair of Ankarana Sportive Lemurs in tree crevice. Seeing these bug-eyed primates cuddling together in such a tight spot and so intently looking at us was poetic. Normally nocturnal, we saw dozens of these lemurs throughout our stay in Ankarana. As well as seeing several examples of the Ankarana Sportive Lemur, we saw the Northern Sportive Lemur which looks nearly identical to the Ankarana species with the only notable exception being a dark dorsal stripe starting from the head and running the length of the back. In the literature there does seem to be some debate on these two species. 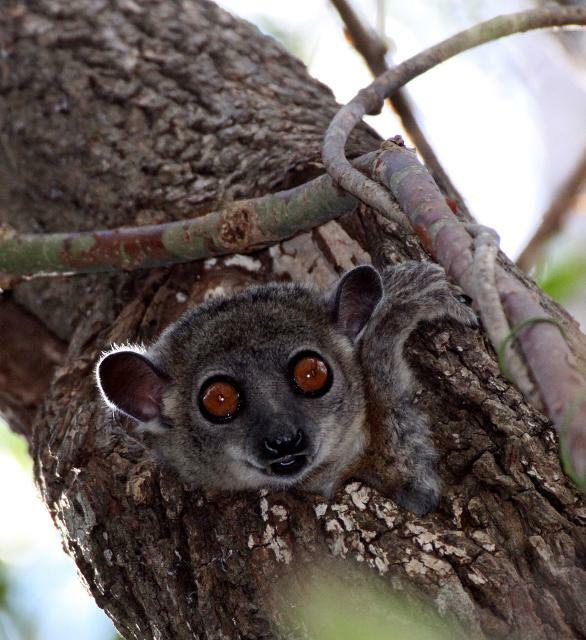 While in Ankarana we had great sightings of several Sanford’s Brown Lemurs and Crowned Lemurs. 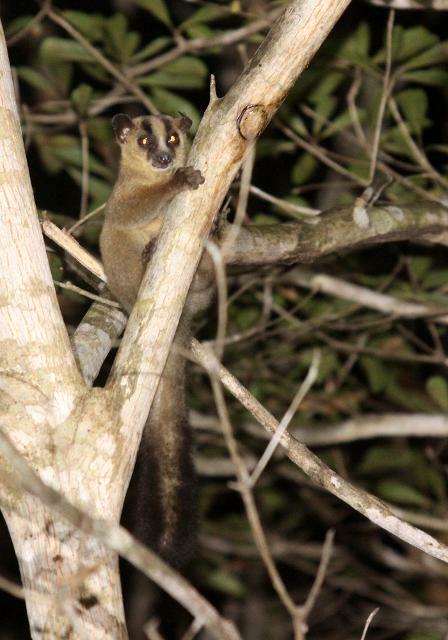 We failed to locate the endemic Northern Rufous Mouse Lemurs until our last night walk, when we saw several teleporting throughout the tree meso-canopies. In the shrubs near the ranger station at the park entrance, Som (of course it was Som – spotter extraordinaire!) spotted two mouse lemurs. Upon closer inspection, it became clear that they were copulating! Those little boogers went at it for the better part of thirty minutes before WE got tired and left. Who knows how much longer they were at it. That evening we also had a close encounter with a beautiful Northern Ring-tailed Mongoose, a relative of the Fosa, who stopped by the campsite near the trailhead to munch on crumbs left around the area. Sanford's Brown Lemur (Eulemur sanfordi) were commonly seen along the trails of Ankarana. This little Northern Ring-tailed Mongoose (Galidia elegans dambrensis) came to visit us while in Ankarana. We trapped and then released this very scared Northern Red Forest Rat in Ankarana! 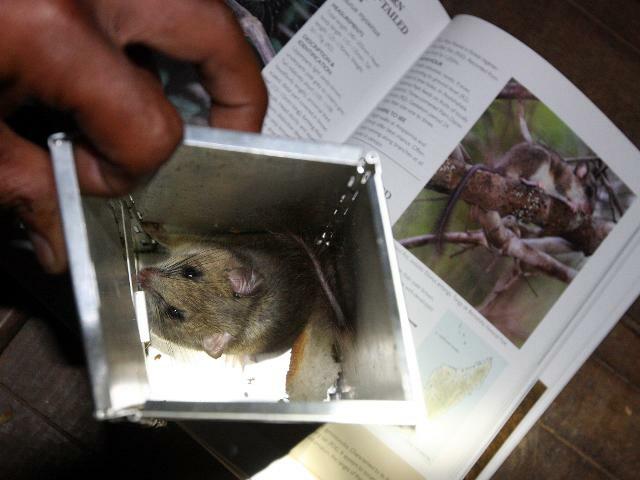 Just before we left our base camp at Tsingy Lodge, we found a large Eastern Red Forest Rat in one of our traps. The kitchen at the lodge was basically an outdoor pad from which the cooks would simply toss out the excess on to the forest floor. I knew that would be a great location for trapping and sure enough we pulled in several individuals of this rat species. Trying to photograph a very pissed off rat was initially a challenge and eventually comical. Forest Rats, we learned, are pretty aggressive and would leap out violently immediately when we opened up the trap. And to add to the terror, they would let out a shrill shriek. Seeing four large men (myself, our guide, cook and driver) scream with it like little girls is something I wish I had caught on video! But after a hilarious group effort, I was finally able to snap some crappy images of this terrified rodent scurrying up the back of our lodge chairs. 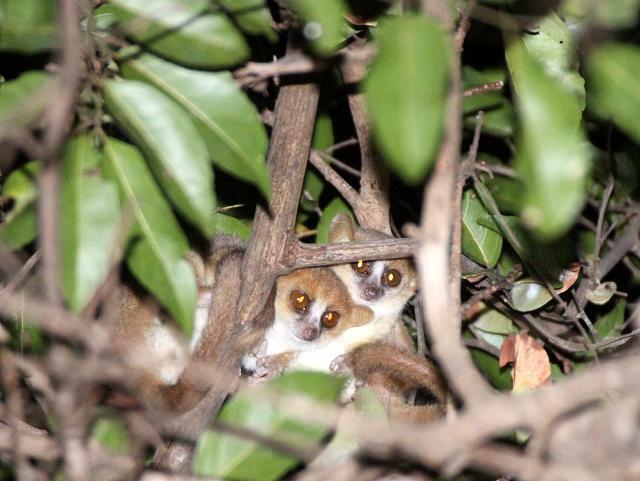 These Northern Rufous Mouse Lemur (Microcebus tavarata) were seen mating for over 45 minutes during one of our night walks! 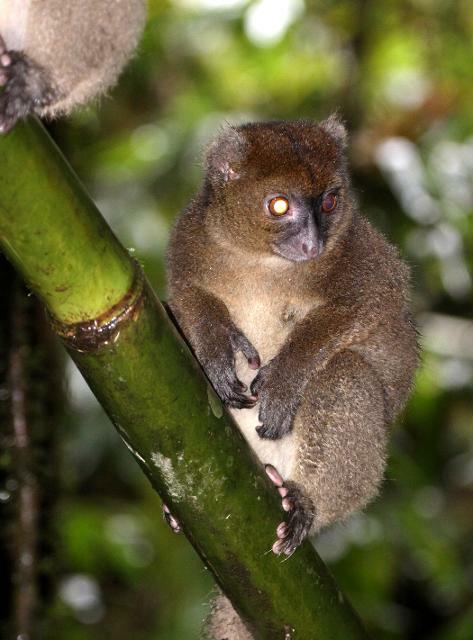 The Northern Sportive Lemur (Lepilemur septentrionalis) is one of the rarer Lepilemurs seen in Ankarana. Ankarana Sportive Lemurs (Lepilemur ankaranensis) were very common in the forests of Ankarana and we spotted them easily once we learned how! 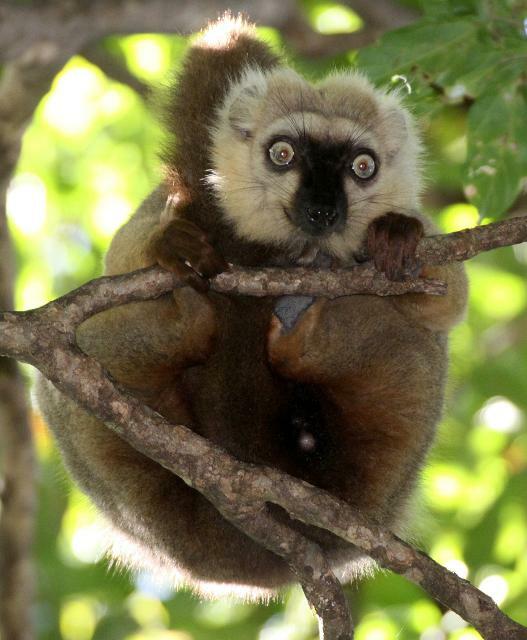 The Crowned Lemur (Eulemur coronatus) was a common fixture in Ankarana. 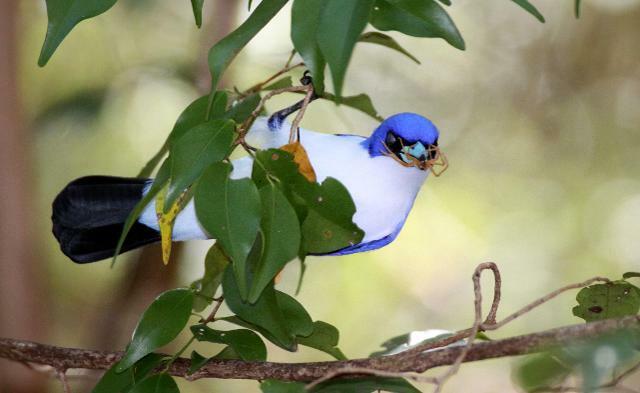 The Blue Vanga was one of the more spectacular birds seen in the forests of Ankarana. Sacred Falls in Mountain Amber National Park. After three amazing days in the Ankarana, we headed for a couple more days at Montagne d’Ambre National Park located just outside of Diego. Along the way to the giant caldera that is the park, we stopped for some fresh fruit, booze and supplies. Once we arrived in this verdant paradise, it became clear that I should have planned more than two days here. 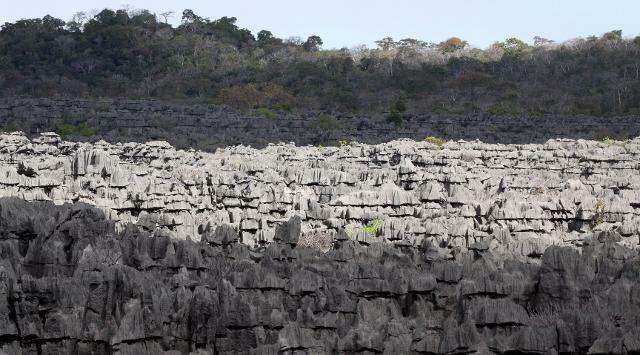 The hot tsingy forest of Ankarana gave way to a lush, green and cool forest station that encircled an ancient extinct volcano which is now home to a lake that is the primary water source for Diego Suarez. While we added no new lemur species from Mountain Amber, we did have many more quality sightings of the Sanford’s Brown and Crowned Lemurs. We missed the Amber Mountain Fork-marked Lemur but our guide told us not to expect to see these as the canopy really is too high for good sightings. 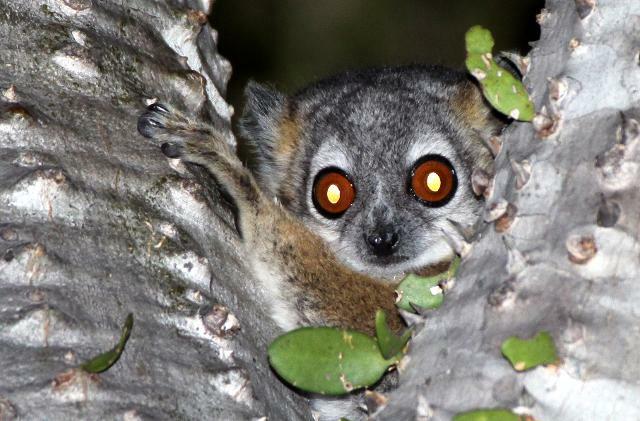 This was the only species of lemur that I had on our “probably-will-see” list but missed. Not bad! 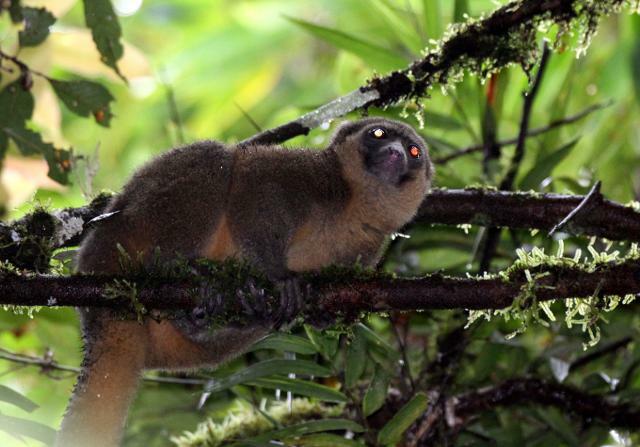 What Mountain Amber lacked in new lemur species was more than made up for in the form of reptiles and birds. An ornithological paradise, we saw many new species of birds in the forest galleries of Mountain Amber. The Mountain Amber Rock Thrush was seen commonly on the forest trails and is considered a “must-see” for bird watchers coming to Madagascar. We also had fleeting glimpses of Madagascar Bald Ibises and Madagascar Grebes in the streams and lakes around the park. 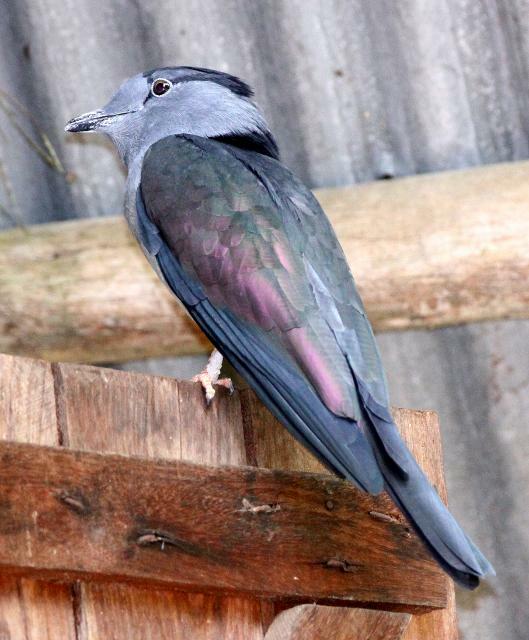 Madagascar Blue Pigeons and Buzzards were commonly seen as well. 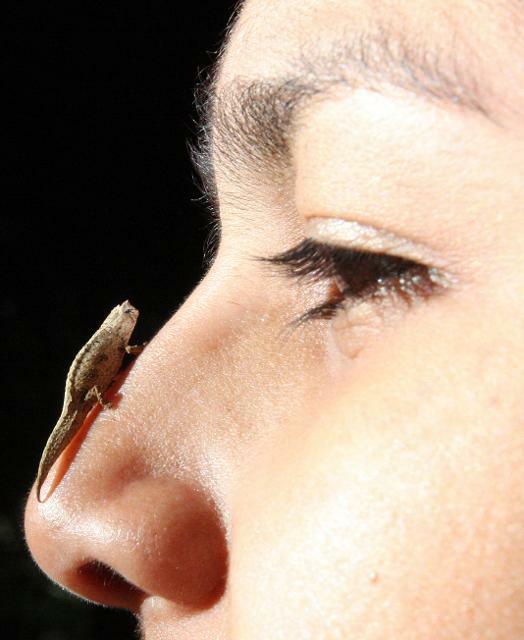 While chameleons were commonplace throughout the entire expedition with dozens of species being seen up close, the reptilian high point was no doubt the insanely small Brookesia tuberculata which reaches a maximum length of 15 mm and is considered to be the smallest reptile on earth. Our guide told us we would see some small chameleons but we had no idea how small they could be! We searched for several of these little guys and played with them for over an hour. They live in the forest duff near the bases of the imported pine trees of the forest station. And when we placed these little chameleons together the males in the group became immediately aggressive and started to face each other down to establish territory. We were all mesmerized watching this tiny battles taking place on the surface of a leaf. Amazingly tiny Brookesia tuberculata eye-balling Som! As predicted we unanimously felt that our time at Mountain Amber was much too short, but we had a preplanned itinerary to adhere too. We spent the next few hours in Diego finding a couple more species of Baobabs located only there and seeing the spectacular caldera bay that has been used by sea voyagers for hundreds of years. Perhaps the most comical part of our entire trip to Madagascar was to take place in the only souvenir shop in Diego. This was a jam-packed small-aisled store with thousands of precariously placed fragile knick-knacks. I should have known something was going to wrong when Som entered the store with her massive backpack. After only a couple minutes of peaceful shopping, Som made a tight corner and snagged the edge of stack of wooden chameleon carvings that started a prolonged and highly destructive cascade of falling curios! Her reaction to that fiasco caused her to jerk in another direction causing a complimentary curio cascade in the other half of the store. I cringed at the thought of the massive bill we were soon to receive, but then the clerk rushed in to minimize the damage. He proceeded to cause a similarly destructive wave of collisions that basically finished off the store. The entire event was worthy of a Three Stooges clip and was equally unbelievable. The clerk basically told us that the store was prime for such destruction and was improperly stocked and let us off the hook. But the ploy worked – our guilt made us buy a way more junk than we would have otherwise. After Diego we had just one final afternoon to spend in Tana. We basically spent it on line, getting caught up with our bills and family and arranging the transportation for the next day’s trip down to Ranomafana National Park located about 10 hours south of Tana. We enjoyed another restful night and delicious dinner at the Sakamanga Hotel. The next morning we beat the morning rush hour out of Tana. 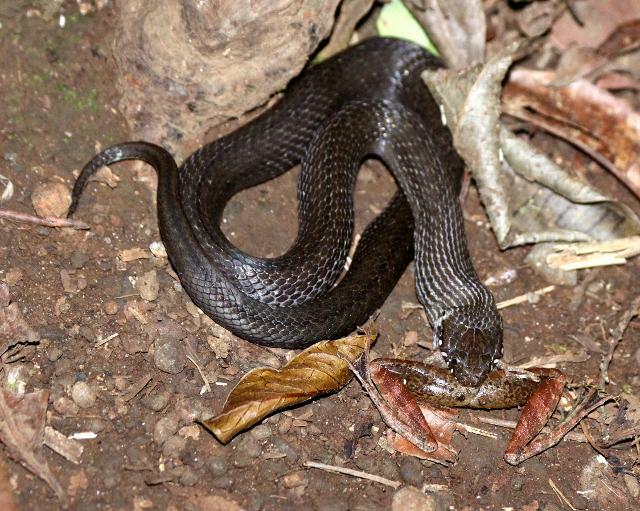 A Madagascar Big-headed Snake (Compsophis albiventris) gorging himself with a tasty frog! 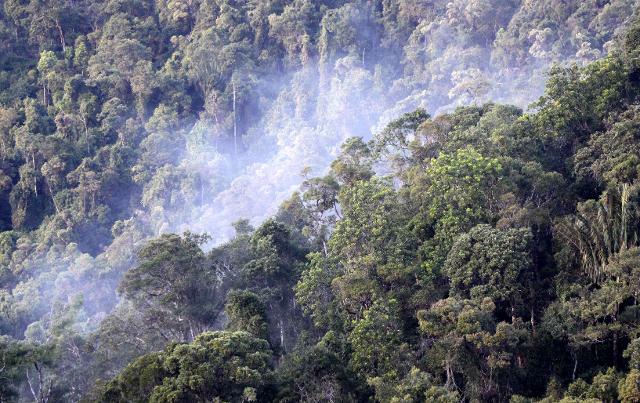 The spectacular cloud forest of Mountain Amber. For the longest time I was dreading the long drive across the central plateau down to Ranomafana. Everything I had read painted the trip as a long, uncomfortable trip into an ecological scarred wasteland of poverty and environmental destruction. While the latter were definitely accurate pictures of the plateau, the trip was not bad at all. No longer a young buck on a tight budget we avoided the famously cramped and dangerous Taxi Brouses that abound in Madagascar and opted for a private car and driver. For about $70 a day, we were able to hire the services of a good, English-speaking driver, an older Peugeot (purported to be the “best car in Madagascar”) and gas for the entire 10 day trip across the country. So our trip was both comfortable and spectacular. And we had the time to stop in Antsirabe, a town well known by the tourist set, where we enjoyed some craft shopping and some delicious pizza at the Malagasy chain, Pizza Gastro. 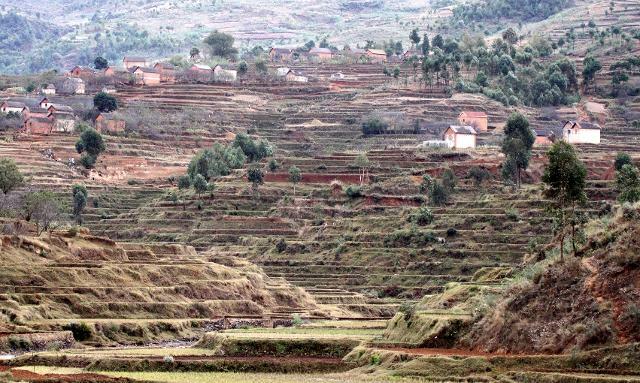 Endless rice terraces cover the once forested central highlands of Madagascar. 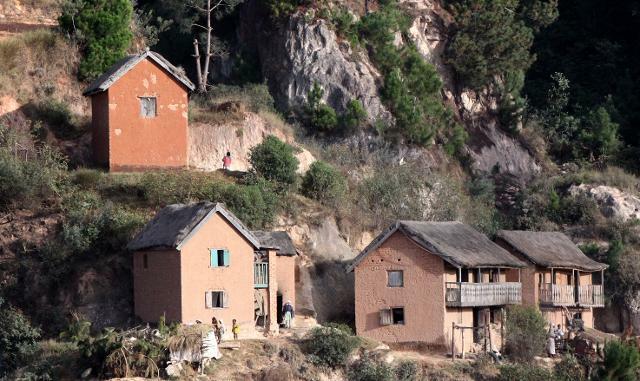 Mud houses in the central highlands. 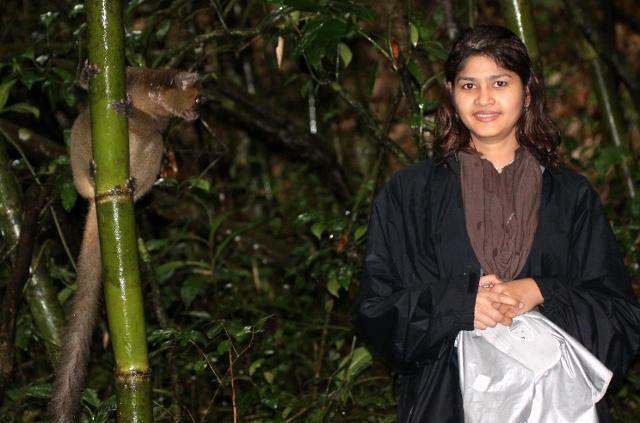 After only 9.5 hours, we made it to the perimeter of the glorious rainforest of Ranomafana National Park, a relatively new protected area that was set aside for a relatively newly described species of bamboo lemur, the Golden Bamboo Lemur, which was our primary target species. We settled in to the famous and upscale Setam Lodge. Generally written up as the best lodging virtually anywhere in the country, we arrived to find a run-down, poorly staffed and very deserted lodge that was clearly suffering from months of no tourists and poor funding. When we asked if we could use our credit card there, the manager begged us to use cash as he needed Ariary to pay his staff who had not been paid in some time. During the five days we stayed in the lodge, there were only a couple other tourists there. 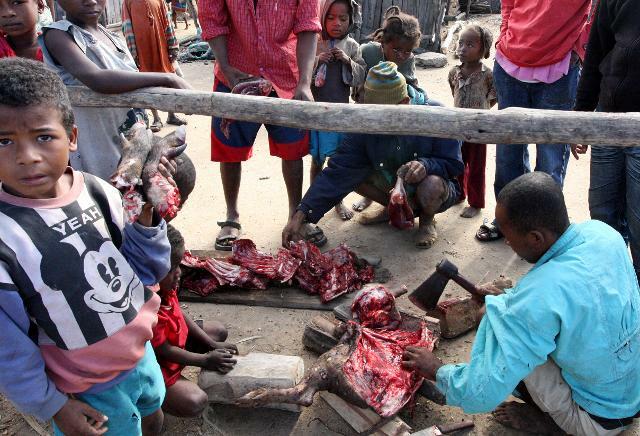 The entire tourist industry of Madagascar was already on very weak footing with the world-wide economic collapse. The industry was dealt a death-blow by the coup. As bad as this was for the local tourist industry, and the guides in particular, we benefited by literally “owning” every park we visited. 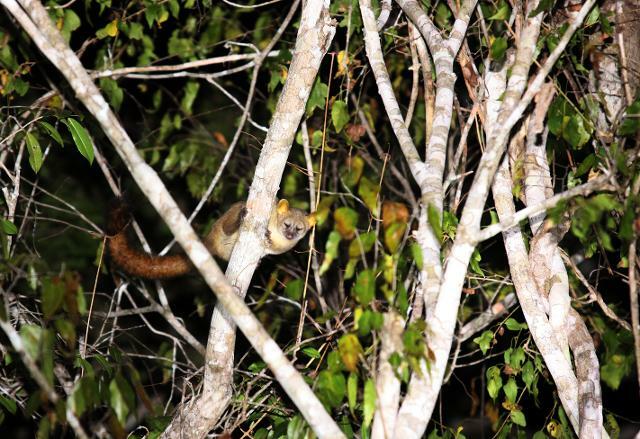 Ranomafana was established to preserve habitat for the Golden Bamboo Lemur which was appropriately our very first species seen in the spectacular wet rainforest habitat covering the steep hills of the region. We hired the services of a local guide named Andre, who I can absolutely recommend. He subcontracted the services of a “runner” which made wildlife viewing very efficient. While we trekked the forest with our guide, our runner would literally sprint up the sides of the mountains searching for our target species. After several days, we came to love the sight of his smiling face racing down the trails to us with his message that he had found yet another rare and elusive lemur species up the hill, down in the ravine or in some cases, over five kilometers deeper in to the forest. While sometimes we arrived to find what he had spotted moved on, generally he was spot-on and his running paid off immensely and greatly enhanced our species lists. We tipped this little athlete well. 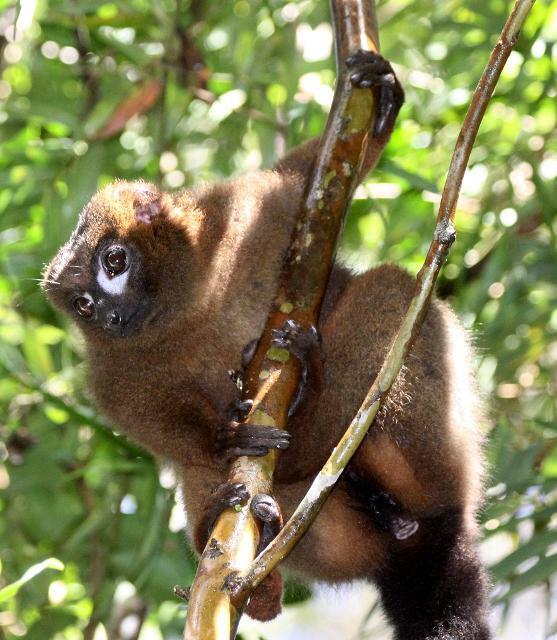 The Golden Bamboo Lemur (Hapalemur aureus) is the primary reason Ranomafana National Park exists! Our stay in Ranomafana was very productive. 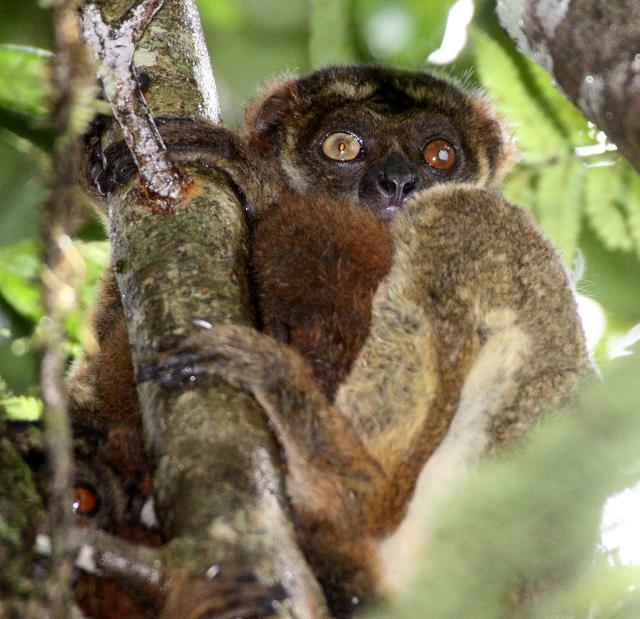 We found Golden Bamboo Lemurs daily and located Eastern Grey and Greater Bamboo Lemurs as well. We shared a very close encounter with a troop of Greater Bamboo Lemurs who stopped to feed on bamboo stems that we plucked from the forest to offer them. While not quite habituated, they showed nor fear whatsoever while they helped themselves to the sprigs in our hands. 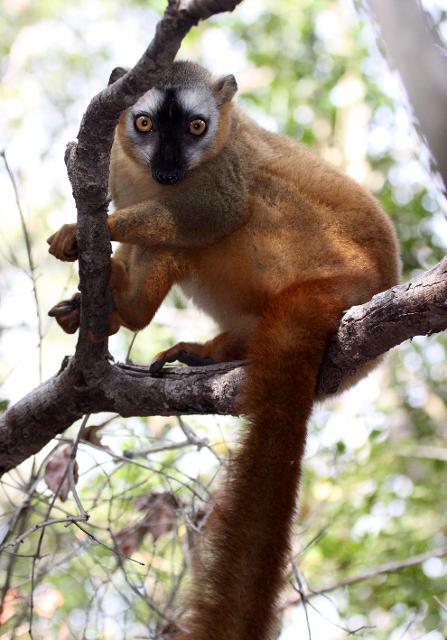 We also had quality sightings of Red-bellied Lemurs with their white eye patches. For days this species was seen only very poorly from a distance but finally we caught a troop right next to the trail where they put on a wonderful show leaping around the canopy and eventually coming very close to inspect us. 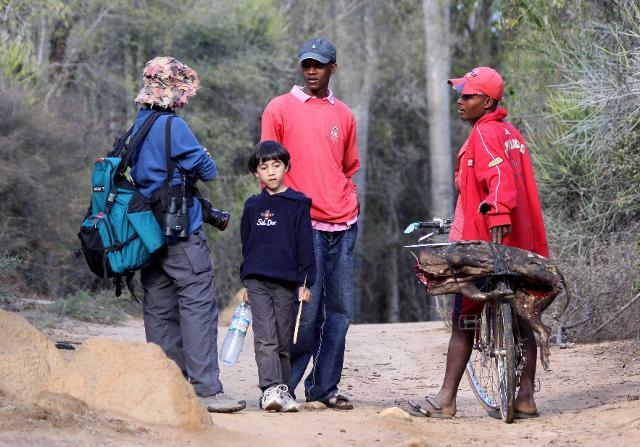 We trekked for hours searching for our second Sifaka species – the Milne-Edwards’s Sifaka. We eventually found a few of them during a rainy trek in a portion of the forest where they are reportedly easy to see. Arguably one of the more spectacular lemur species anywhere, I wish we had been able to see them in better light and a bit closer. But our luck had been so good on the expedition, I felt a bit spoiled by wishing such things. A male Red-bellied Lemur (Eulemur rubriventer). Our final lemur species that we spotted in the region was the Eastern Avahi or Woolly Lemur which we spotted in a family-grouping snoozing in the fork of a medium-sized tree deep in the rainforest. How on earth our guide spotted these is still beyond me. 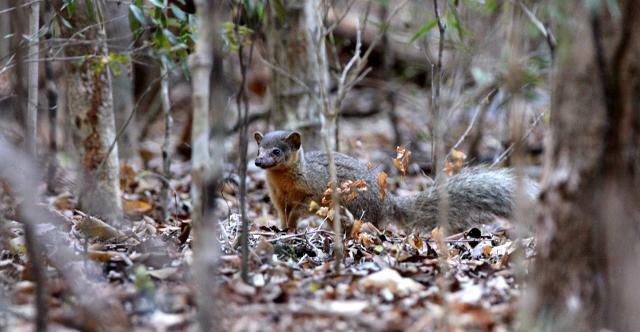 While on a trek to spot lemurs, Som and I had a fleeting encounter with the Eastern Ring-tailed Mongoose who popped out of the primary forest to give us a good sniff before casually heading back on his merry way in to the forest. Although I was not quick enough to get an image, it was great to add the other ring-tailed mongoose subspecies to our list. Milne Edward's Sifaka (Propithecus edwardsi) was a very difficult species to see but we finally lucked out on our last day. 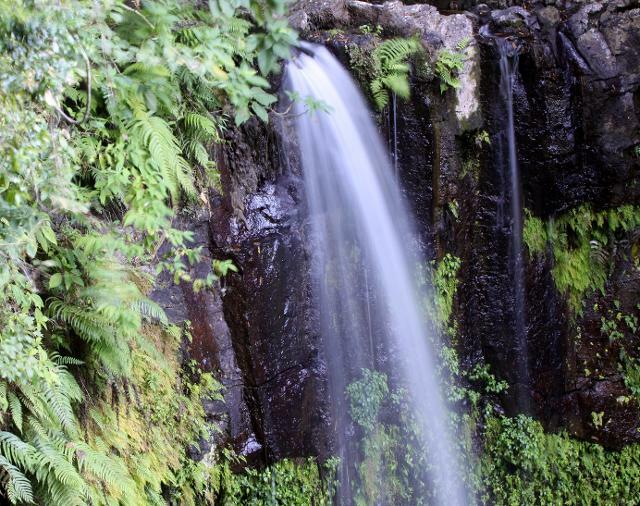 Our time at Ranomafana was productive, thrilling and filled with long, wet treks. While we worked our arses off there, we appreciated the exercise and exposure to a wonderful rainforest community. Rain was omnipresent while there so high-quality photography was difficult but not impossible. There were a couple times I was sure I had destroyed the gear but once dried, everything seemed to return to good working condition. Ranomafana did not disappoint us on the bird-fauna front either. We added many new species to our list here. 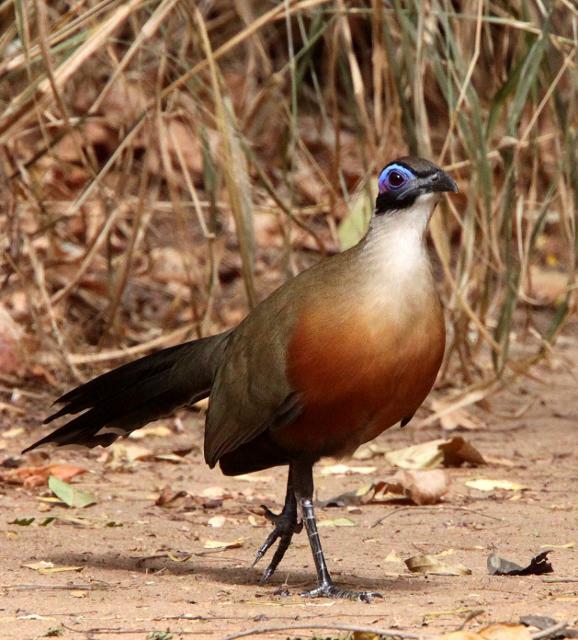 Blue and Red-fronted Coua were common as were both species of Madagascar’s endemic nightjars. Tylas, Greenbuls and Asity were common as well. The insects were well represented too. My first sighting of the Giraffe Beetle was spectacular. 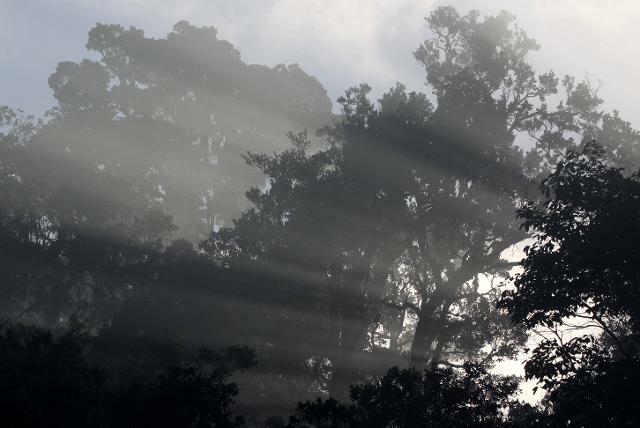 The morning of our drive back through the rainforest toward the central plateau was both wet and foggy. As soon as we reached the altitude of the plateau, leaving the rainforest, the rain gave way to a clear, sunny and warm day. The ten-hour drive was beautiful and I didn’t mind seeing the same villages, rice paddies and villagers we had seen on the way down. We stopped to pick up some more Pizza Gastro along the way in the beautiful town, Antsirabe. Although but US standards, the pizza is mediocre, having it twice in Madagascar made it a delicacy to be relished for years to come! The Eastern Grey Bamboo Lemur (Hapalemur griseus) was another species of Bamboo Lemur seen in Ranomafana. Damn they were cute! The Greater Bamboo Lemur (Prolemur simus) is supposedly the rarest primate in the world, but we had about a dozen come up to us while trekking the jungles of Ranomafana. Our next destination was over three hours beyond Tana, so today’s drive was to be particularly long. Our driver did it all with grace and professionalism. 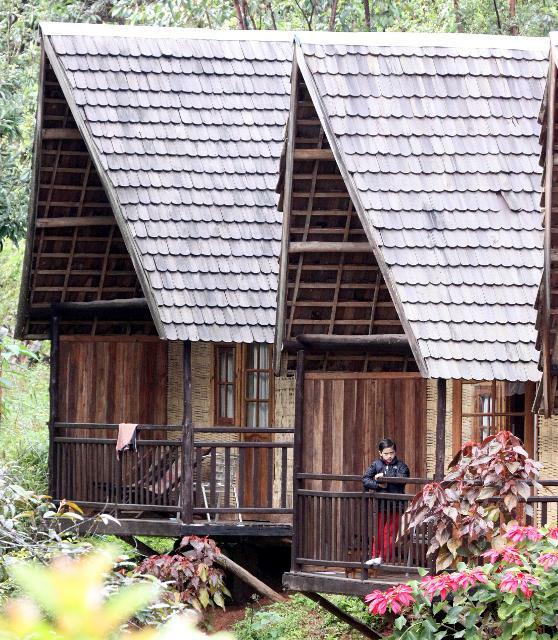 We arrived at the Feon’ ny Ala Lodge located just outside of Mantadia National Park with some daylight to spare. Once we got settled, we grabbed a great dinner at the cantina and started the first of many night walks up the main road bordering the park. While I had read in previous trip reports that it was possible to see Aye Aye in the banana orchards along the main road, I held no such aspirations. 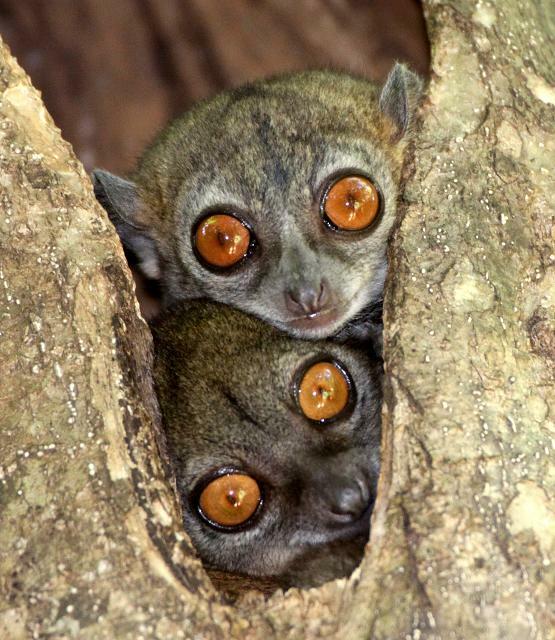 We spotted two species of mouse lemurs however – Goodman’s Mouse Lemur and Grey Mouse Lemurs. These two species were common along the road. The speed at which they cruise the trees is almost unbelievable. They can almost appear to be in two places at the same time! 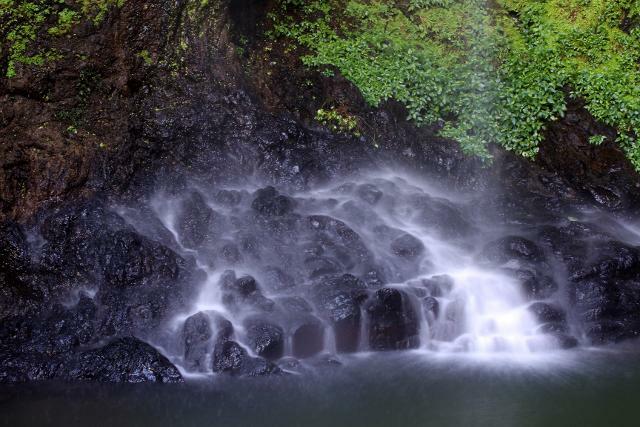 Our stay at Mantadia and Andisabe National Parks was easily as wet as the time at Ranomafana. That didn’t stop us from getting out and getting wet however. 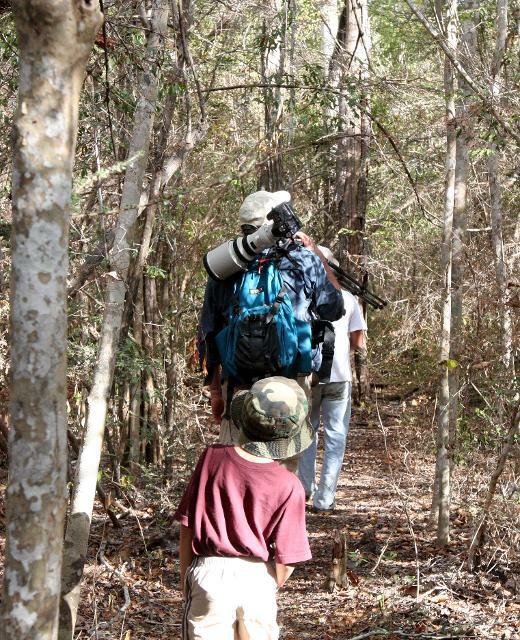 The trails at Mantadia are fairly easy and getting good sightings of the lemurs there is nearly guaranteed. 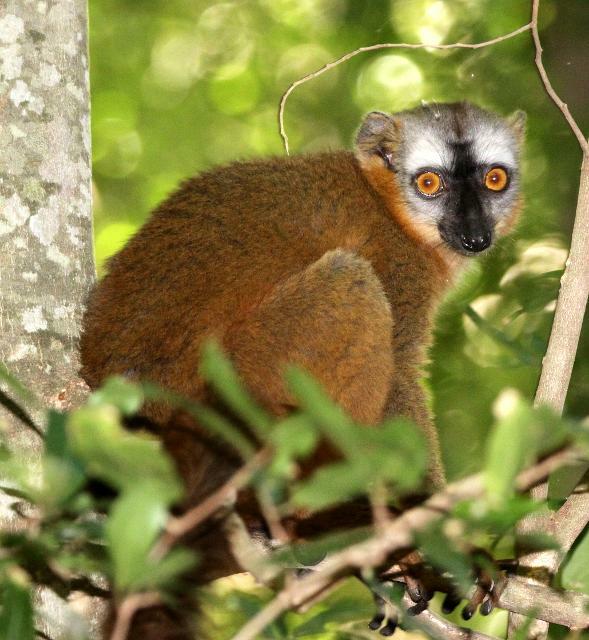 On our first morning’s trek, we had quality sightings of Common Brown Lemurs and Eastern Avahi (Woolly Lemur). 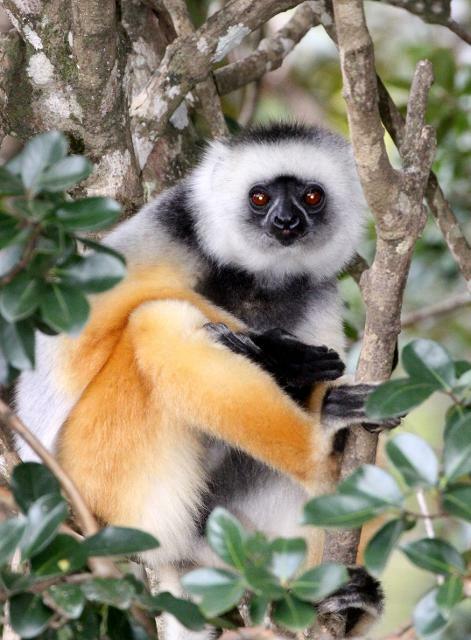 Our first good look at a small family group of Diadamed Sifakas will not soon be forgotten. 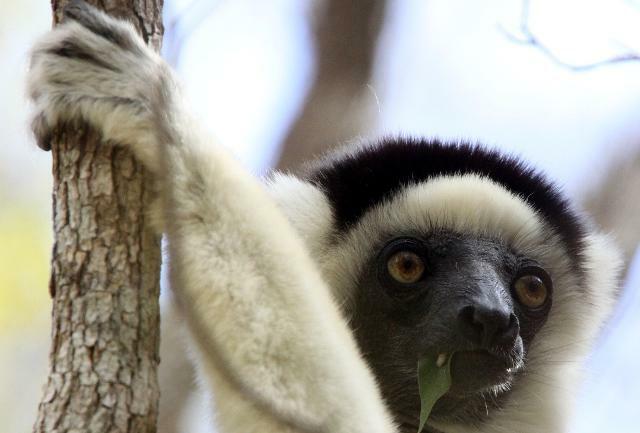 If there is one must-see lemur in Madagascar, the Diadamed Sifaka is it. I would be hard pressed to think of a more spectacular animal in any group in any place on Earth. 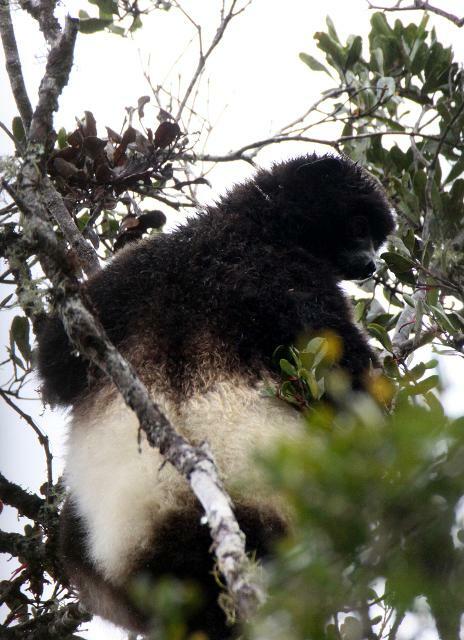 We were fortunate to see Diademed Sifakas daily in Mantadia. 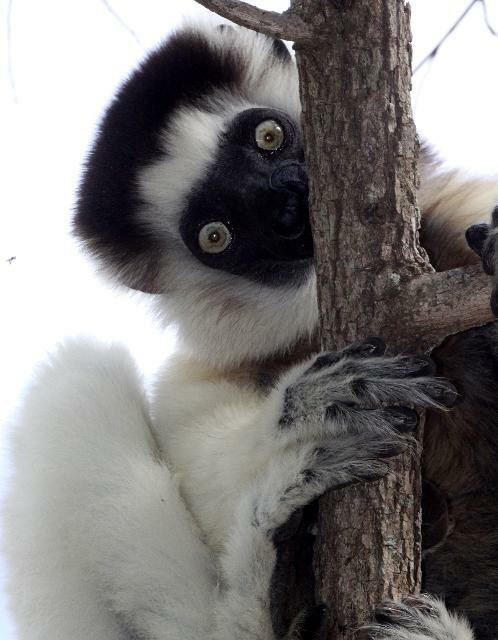 I can say that the Diadamed Sifaka (Propithecus diadema) is without a doubt the most spectacular lemur in town! 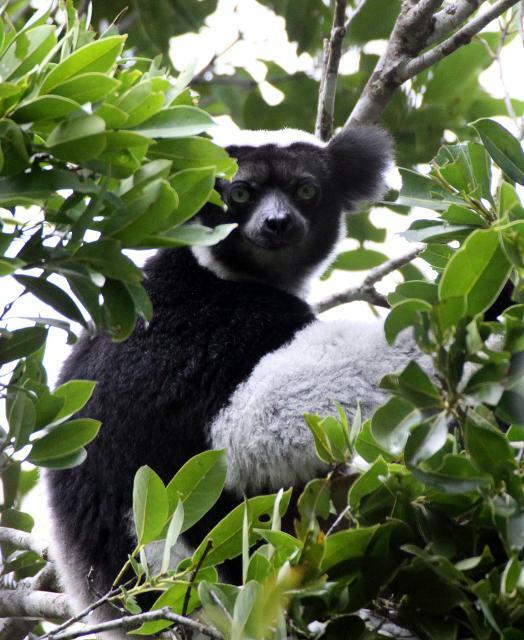 The key species of the Mantadia-Andisabe (Perinet) complex is the world-renowned Indri. 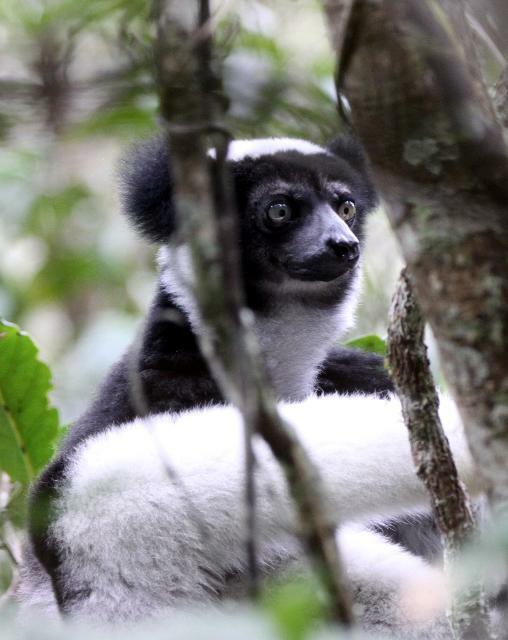 There is little doubt that the early explorers who coined the common name, “Lemur” (the sirens or ghosts of the forest), did so after hearing the morning cries of the Indri. The cry of this primate is a sound that will never be forgotten. I have heard the morning calls of primate species all over the planet, but the sounds of the Indri are matched by no other species. The melodic, soothing cry permeates the forest for miles. I made reservations at the Feon’ ny Ala Lodge as I had read that the sound of the Indri is what greets the guests the first thing in the morning. But I was more than a little disappointed when I failed to hear any cries at all our first morning at the lodge. I went to the cantina to ask if they generally hear the Indri call in the morning, and they all took a quick glance at their watches and said, “Not yet. They start crying at nine.” I chuckled thinking that was a joke. I returned to our bungalow and began getting caught up on my lists and editing some images. 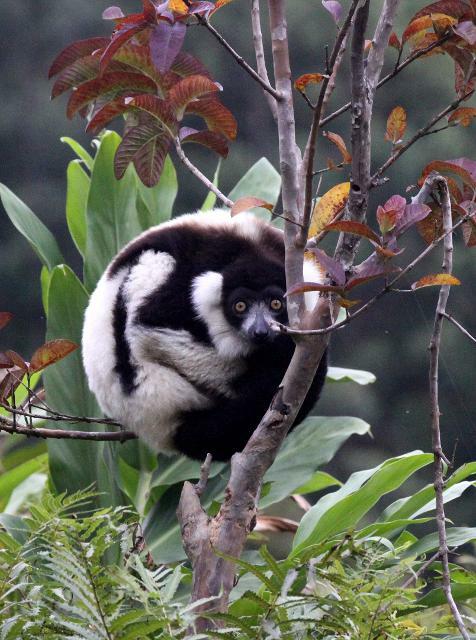 After about an hour or so, the amazing cries of the Indri started! I looked at my watch, and sure enough it was nine o’clock on the nose! I couldn’t believe it. Every morning at nine, the forests erupted with the most amazing cacophony of primate whining anywhere on earth. 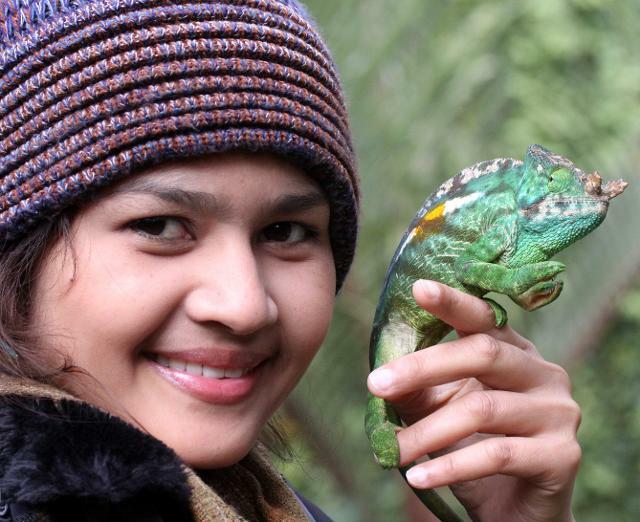 The amazing Indri indri, the most beautiful singer in all of Madagascar. Our five days in Perinet were well spent trekking and searching for ever-better views of the species we had seen on our first hike in to the forest. We spent one morning trekking the primary old growth forest of Andisabe National Park about two hours further north on really bad roads. We saw many troops of Eastern Grey Bamboo Lemurs, but our target species were Black & White Ruffed Lemurs, which are limited to primary forests. After a couple hours of intense trekking, our guide’s runner finally spotted some that were “not too far” – a Malagasy euphemism for, “way the hell up the insanely steep mountain four kilometers away!” So we proceeded to blaze a new trail straight up the steepest mountain in the park for about 2 kilometers. We were all completely red with fresh Malagasy mud when we finally spotted three glorious Black & White Ruffed Lemurs sleeping a branch at the top of a forest giant. We spent some time snapping images of these sleeping beauties before we headed down the mountain on a well used, MUCH gentler trail than the one we ascended on. It was all an adventure. 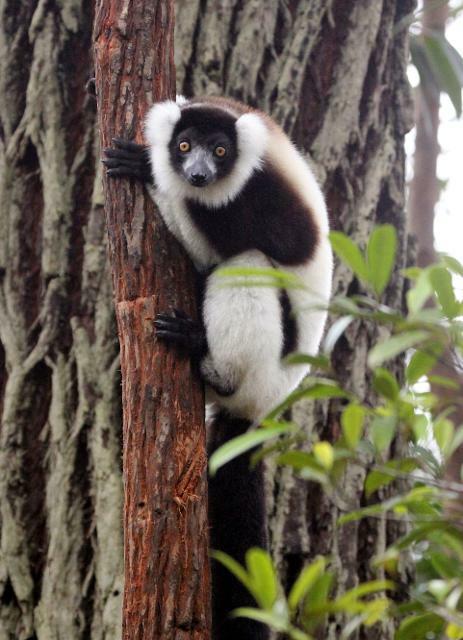 We woke this Black and White Ruffed Lemur (Varecia variegata) during a visit to Andisabe National Park. A curious Black and White Ruffed Lemur in Mantadia. On the way back to our lodge, I decided to stop by the Vakona Lodge to see some birds that I heard could be seen around the lodge. I thought it was strange when I had to pay for the right to see them, but the cost wasn’t absurd and I thought maybe I could get some good shots of some species I had yet to see well in the wild. I was pretty disappointed however to find out that the birds were actually caged. Som rubbed it in as well that I had just paid to see caged birds. I did snap some good shots of captive birds, but left the site disappointed. As we were about to leave we did get some excellent views of a surprisingly huge Madagascar Cuckoo Roller which made the stop worthwhile. But as we were getting ready to get in our car to head back to our lodge, our guide told us that we had also paid to go to Lemur Island. This was a surprise to me, and Som heard about it, she was inclined to ditch it as yet another series of caged and depressed animals that could do nothing more than to create another anticlimactic moment to end our 28 days in Madagascar. But I talked her in to going as we had already paid for it – why not!? We took the 5 meter canoe trip over to the island. The second we got out of the canoe we were immediately greeted by a gorgeous Black & White Ruffed Lemur and a couple of Common Brown Lemurs who immediately climbed on top of Cokie’s and Som’s head to receive the bananas we had purchased in the parking lot. While the entire two hours we spent on the island was touristy beyond compare, having the rare opportunity to spend such quality time with five species of habituated lemurs was an experience we all agreed was a high point for the trip! None of us wanted to leave. 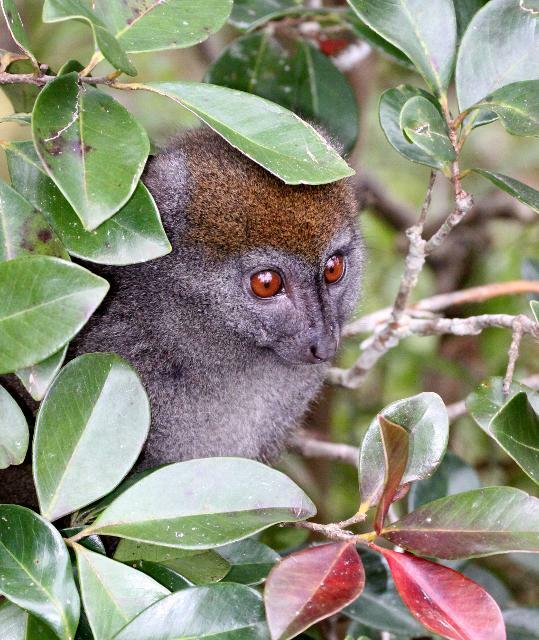 The Common Brown Lemur (Eulemur fulvus) was actually one of the less common lemurs in the area! 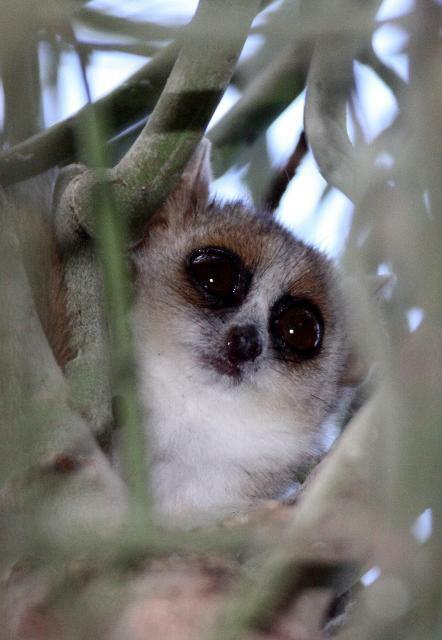 We saw two species of mouse lemur in Mantadia. This cute Brown Mouse Lemur (Microcebus rufus) was very cooperative for a nice shot in Andisabe. There are over six Eastern Avahi (Avahi laniger) in this group! Som with a couple friendly Common Browns at the Vakona Lodge. Cokie at our chalet in the Feon Ny'ala Lodge near Andisabe. 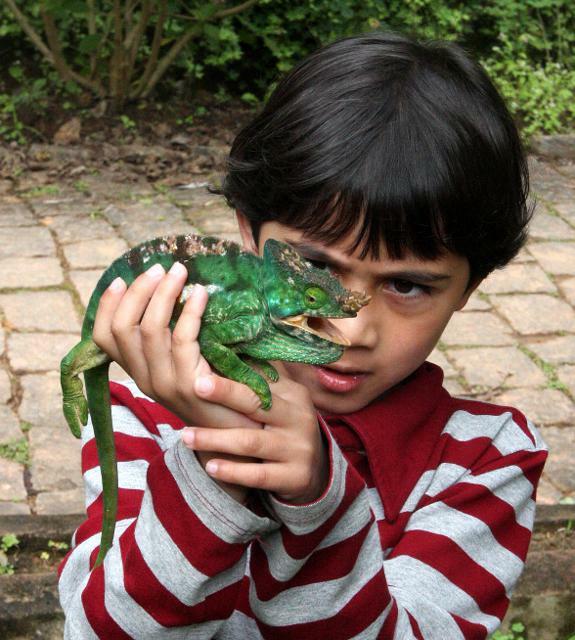 Som with her very own Parson's Chameleon (Calumma parsonii) in Andisabe! Our last day at the Feon’ ny Ala lodge was bittersweet. Our expedition to Madagascar was nearly finished and we were looking at another trip to Tana Airport, which we had come to know very well after all of the eight connections made during the previous four weeks. Som was tired of the overt poverty of Madagascar, and I was really tired of horrible petit de’jeuners that we were fed daily. 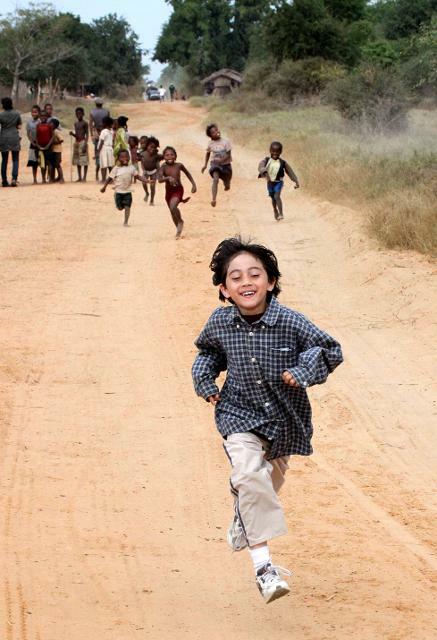 But all of us had come to love Madagascar and the Malagasy people. 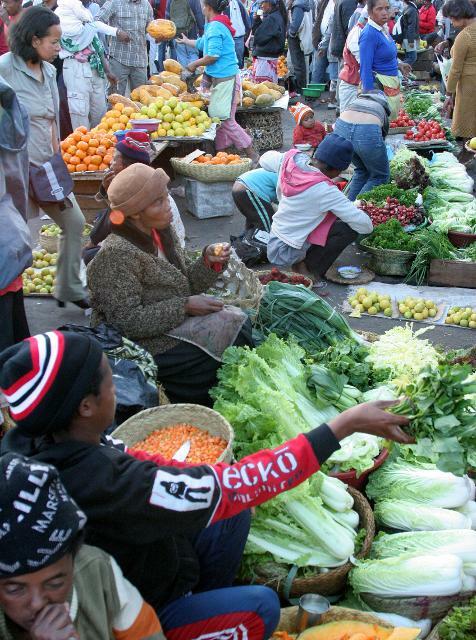 All of our encounters with the Malagasy were positive and we felt at home wherever we were. They Malagasy were genuinely friendly and helpful throughout our trip. And our first exposure to this amazing island nation was thoroughly enjoyable. And of course the wildlife was beyond compare. There are very few places left were I can rack up 42 new lifer species in one trip! Madagascar absolutely ranks as one of the world’s greatest wildlife hotspots boasting more endemic species than virtually any other country on the planet. We felt lucky to see what we did but equally surprised at the ease at which we were able to see so many of the species. As our plane lifted off from Tana international, I couldn’t help but wonder what the future held in store for the highly endangered species and habitats of this volatile nation. I felt an immediate longing to return someday, but I had an even stronger sense of hope that cooler minds would prevail, and once again a conservation ethic would take hold at the higher levels of Malagasy government to protect the little that is left of what was once wild Madagascar. The Crested Coua (Coua cristata) seen in Kirindy. This Rufous Vanga (Schetba rufa) was also seen in Kirindy. A Lesser Vasa Parrot in Andohahela. 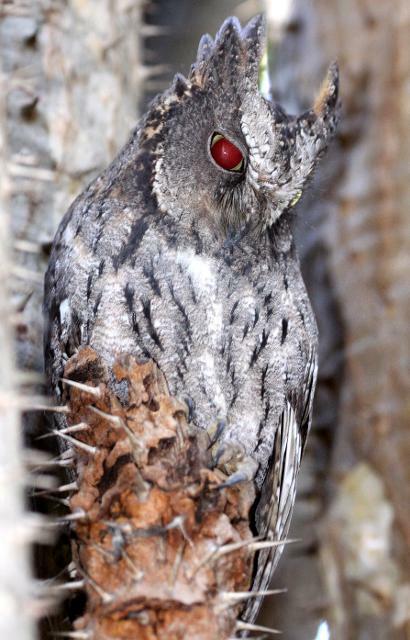 A Madagascar Scops Owl from Ankarana. 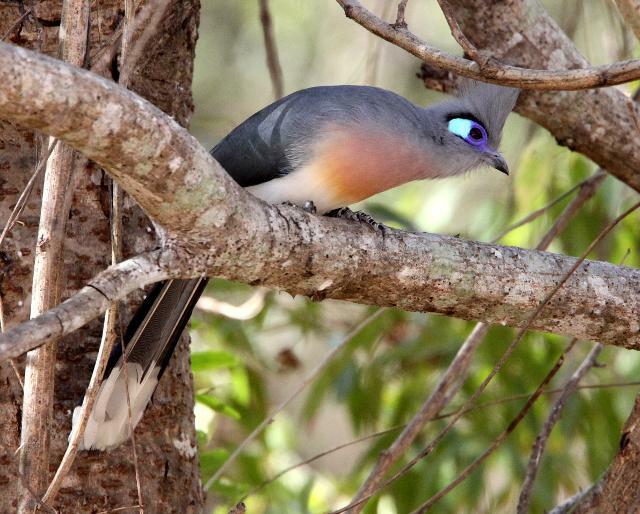 This Madagascar Cuckoo Roller (Leptosomus discolor) was a regular at the Vakona Lodge. This Giant Coua (Coua gigas) was a regular in Kirindy. *One of the 87 endemics!